You can see I’ve been on a knitting kick, lately. Here’s another project I’ve recently finished. I made it for my niece. It was a surprise, and I asked her model it with the t-shirt she was wearing at the time. I’m sure it will be cuter with the right outfit. 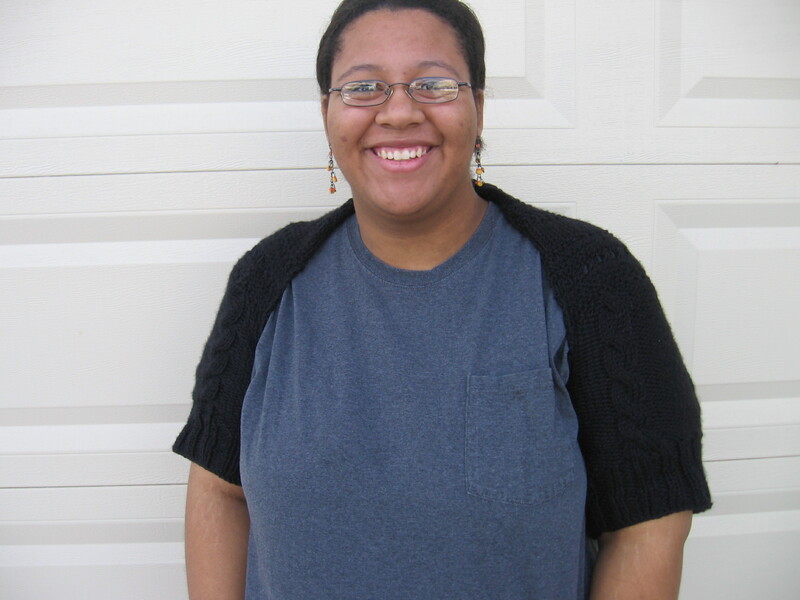 . . but doesn’t she have a great smile?! She’s a sweetheart–so appreciative, it makes me really enjoy making things for her! In the cooler weather that’s coming, there are very few things that make a person feel so scrumptiously warm and comfortable as a Cozy-Hug-Shrug! Here it is! I mentioned in my last post that I had accepted a challenge to reproduce a vest that my grandma used to make for some of my younger cousins. 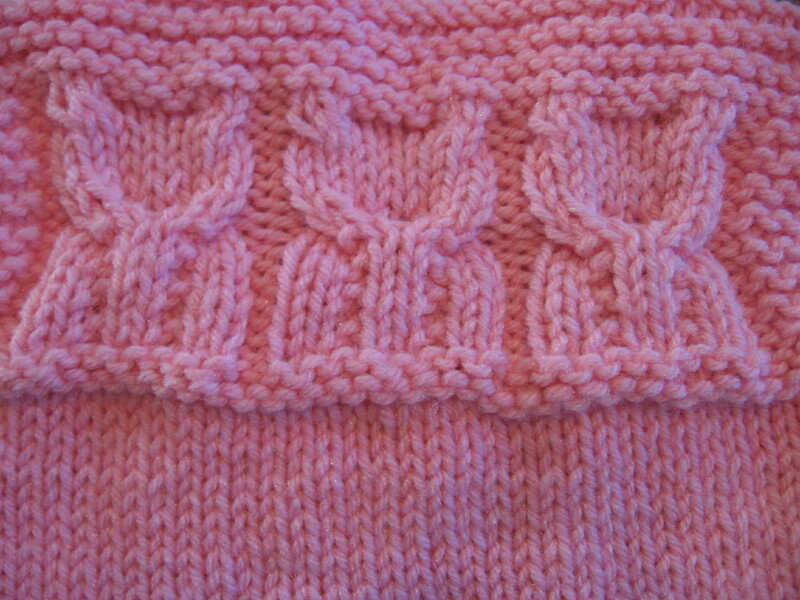 I thought that they were owls, and knitted up the dress for my niece before I saw pictures of the back. I’d forgotten–or maybe never saw–that they had kitty tails! I hope that, with the pictures, my instructions will be fairly easy to follow (even though I’m obviously not a professional photographer, as evidenced by some fuzz and discoloration.) I’m not really satisfied with the buttons I had on hand, so I hope you’ll overlook them, but I was really anxious to get it posted. I’ll switch them out if I can find some better kitty eyes, but for now, MEOW! MEOW! MEOW! 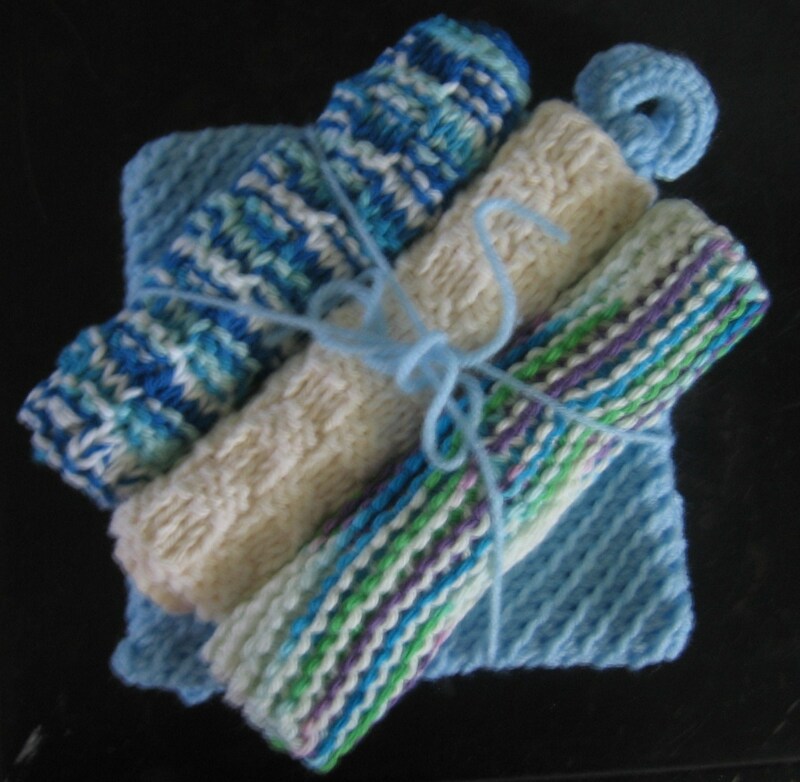 Materials needed: Four ounces of worsted weight yarn, size 9 knitting needles (or size to produce the desired knitting gauge) You’ll also need a size I(or 9) crochet hook and a tapestry needle. Gauge: 14 stitches makes 4 inches. 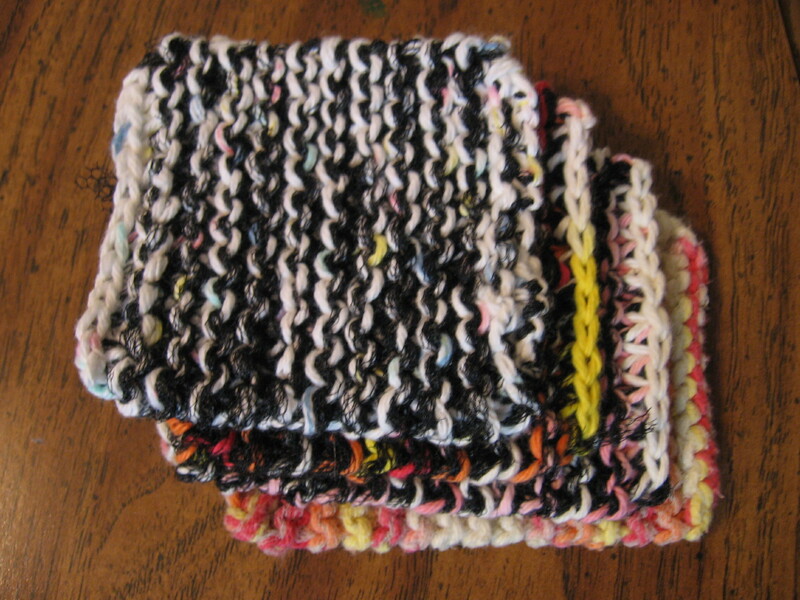 22 rows make 4 inches. Finished measurements: 10.5″ X 13″ (11.5″ X 14.5″) Differences in the instructions for the larger size are in blue in parenthesis. If not noted, the instructions are identical for both sizes. 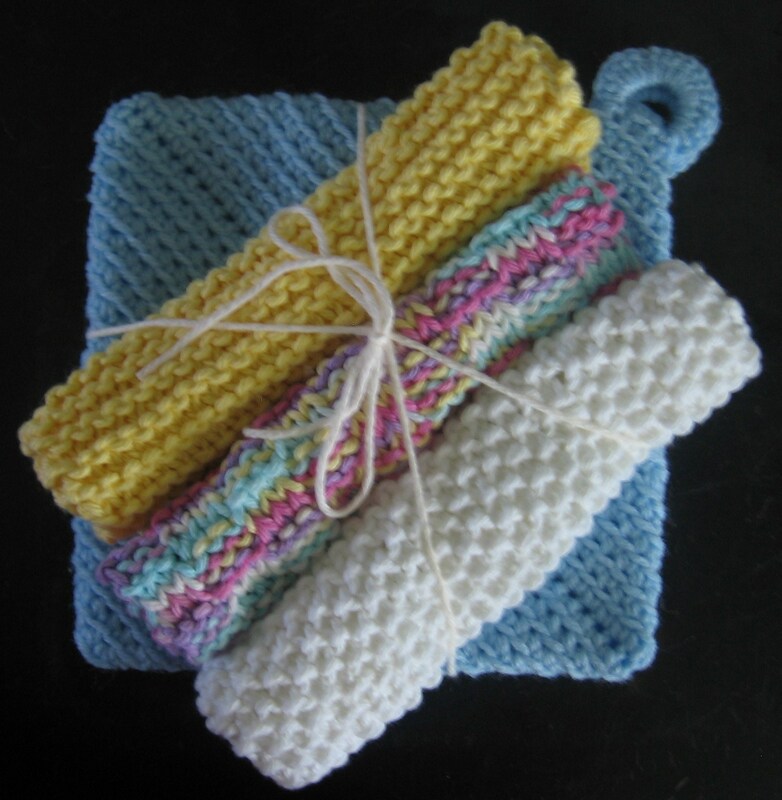 Skills Required: Casting on, garter stitch, stockinette stitch, cable stitch, crochet chain and slip stitches, binding off, side seam (mattress stitch) and seaming two bound off edges. Refer to verypink.com to brush up on any of these methods. Remember this: Odd numbered rows are worked from the right side. Even numbered rows are worked from the wrong side. This will help you count rows, and keep track of where you are in the pattern. 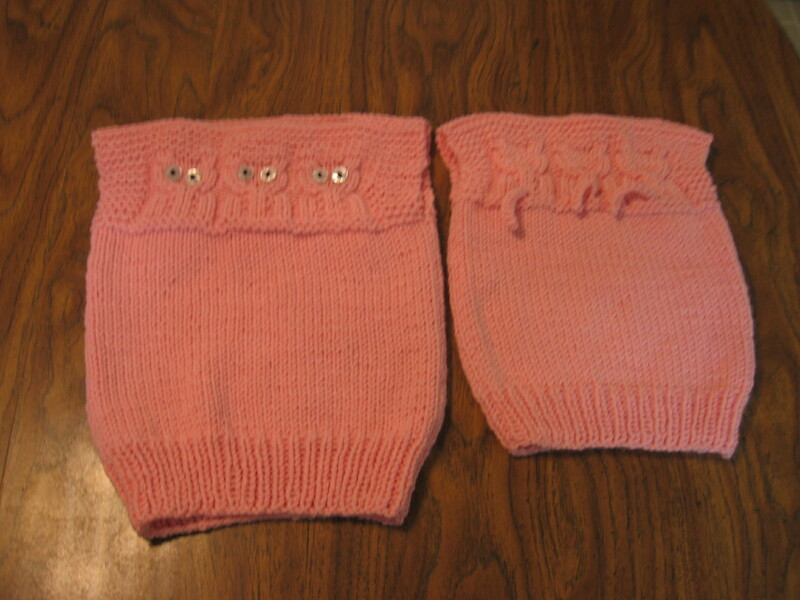 The front and back of the vest are identical with one noted exception–the tail row. 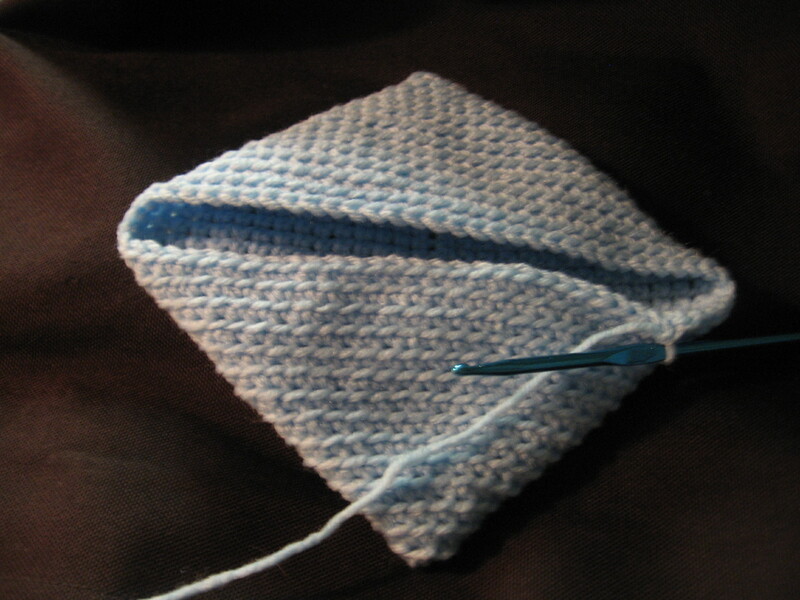 Cast on 40 (44) stitches, making sure to leave a generous tail 18 to 24 inches long. These will be used to seam the sides. 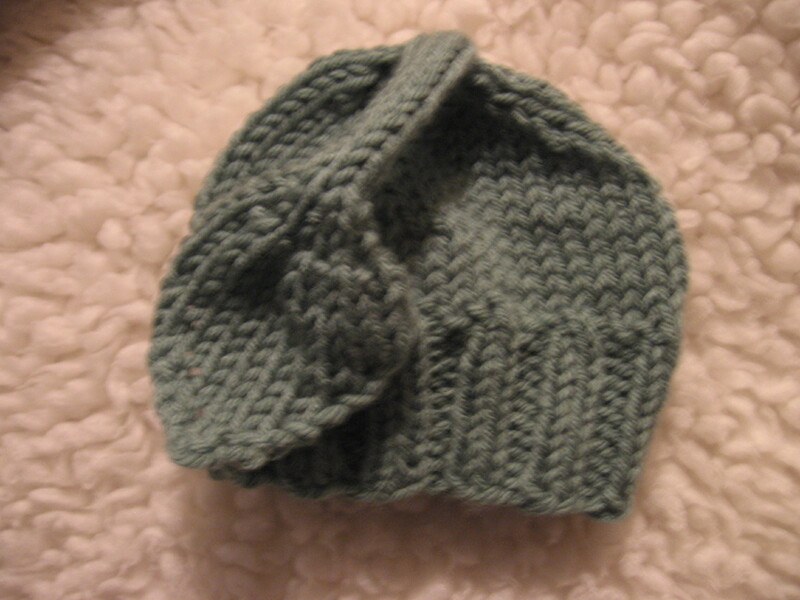 (See my post on Grandma’s Booties for help casting on.) 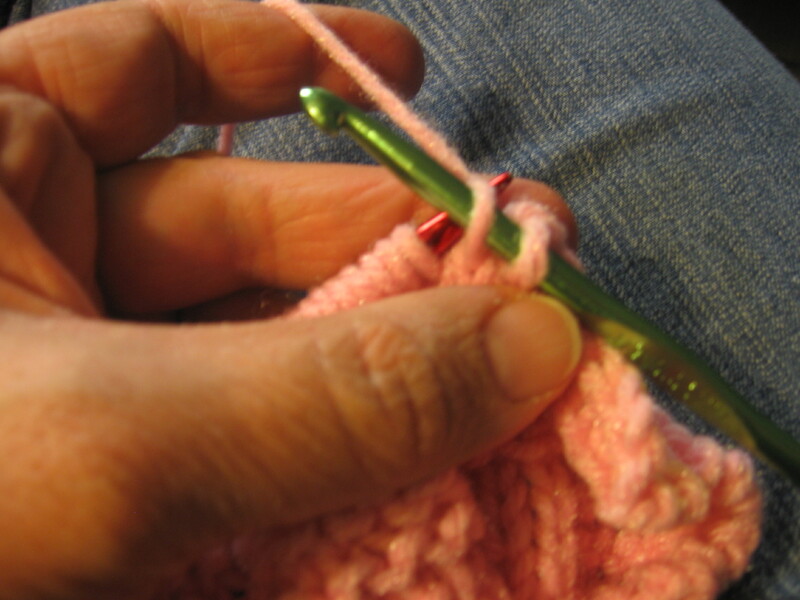 Tip: After you have knit several rows, use a crochet hook to “use up” the tail temporarily to keep it from tangling with your working yarn. 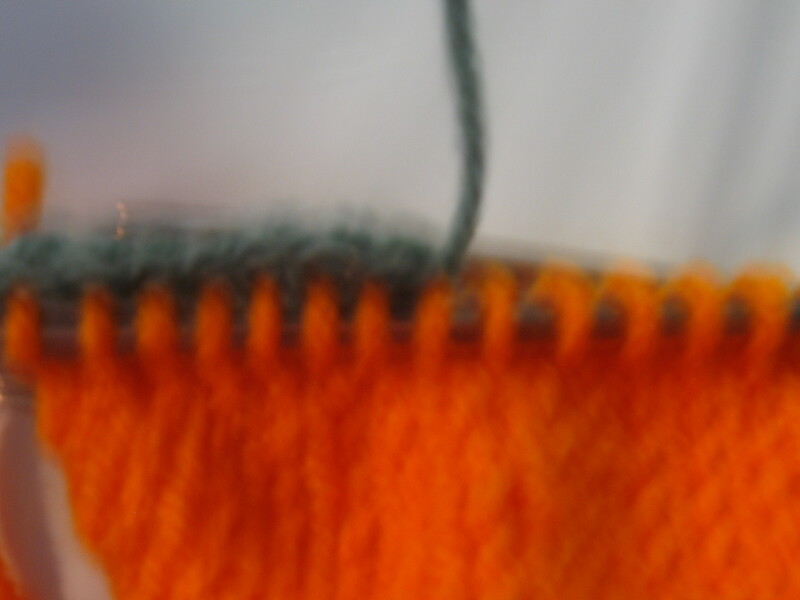 Row 47 (51): Purl across the row. 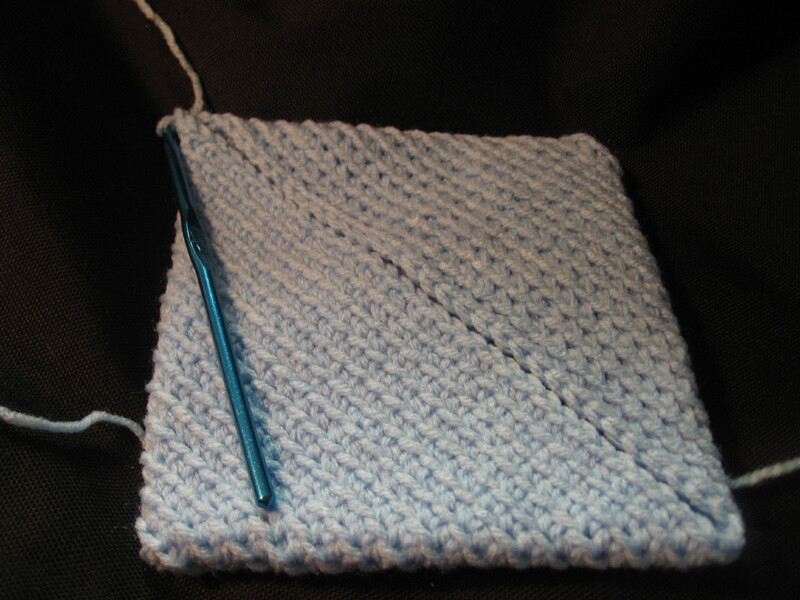 Beginning with row 48 (52) you will be working a garter stitch along the first and last four (six) stitches of each row. Row 50 (54) P4 (6), K2, (P2,K1, P2, K1, P2, K2), repeat sequence in () twice, P4 (6). Row 51 (55) : P6 (8), K8, P2, K8, P2, K8, P6 (8). 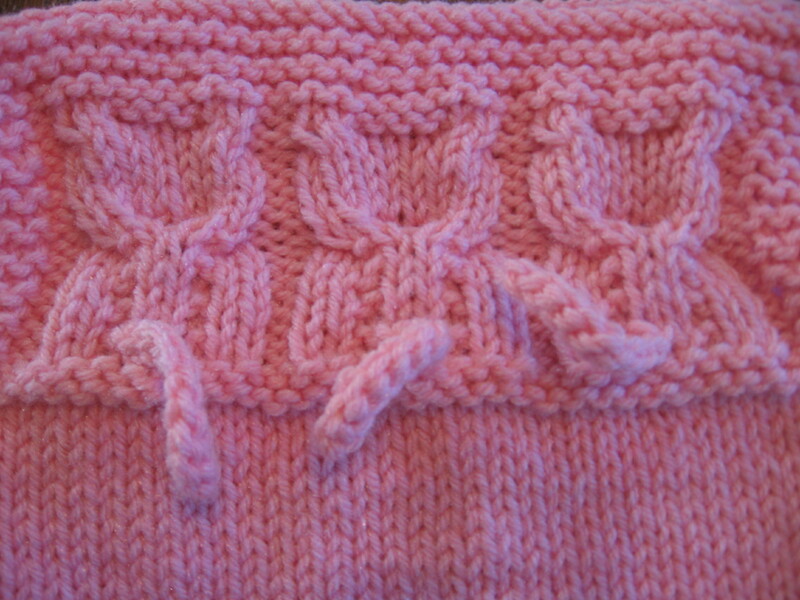 Row 65-70 (69-74): Work in garter stitch Purling each row. 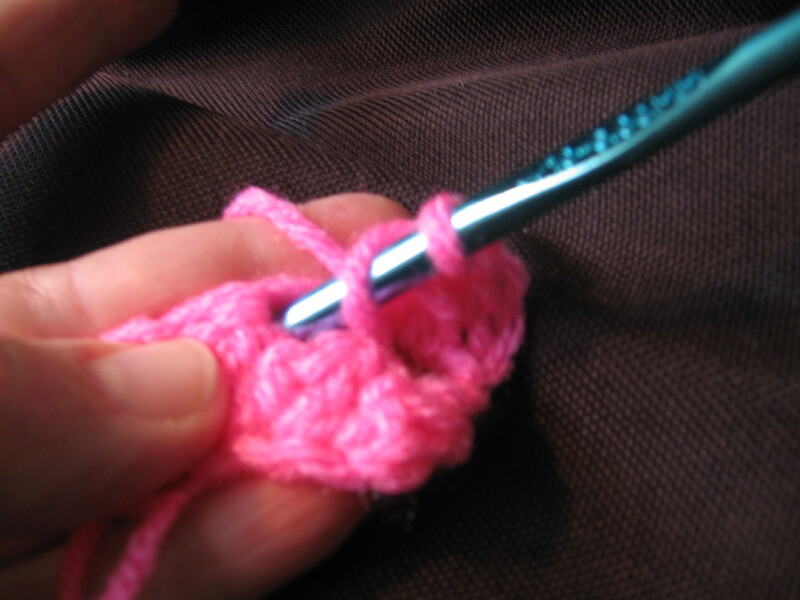 Row 71 (75): Bind off using crochet hook in this method from verypink.com. Leave a 10 to 12 inch tail on each (front and back) to sew up the shoulder seams. 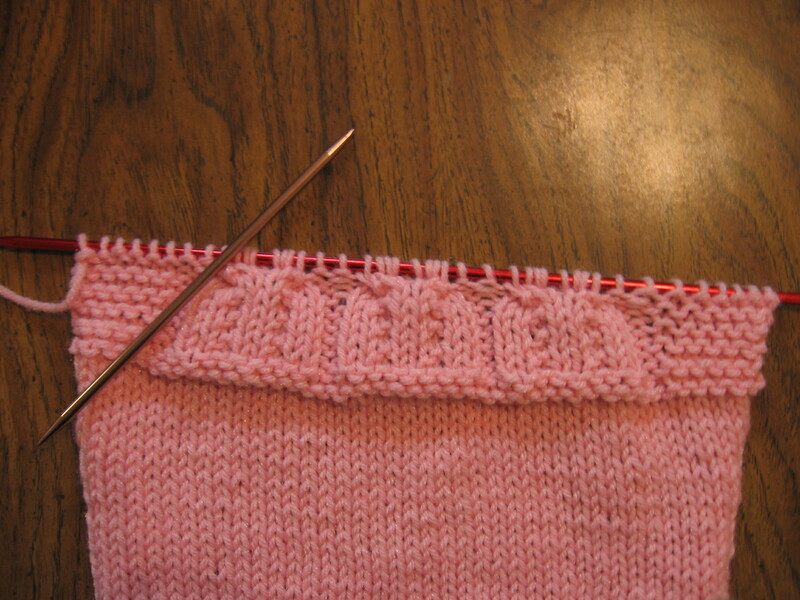 Once you have finished knitting the front and back, place them together with wrong sides facing. 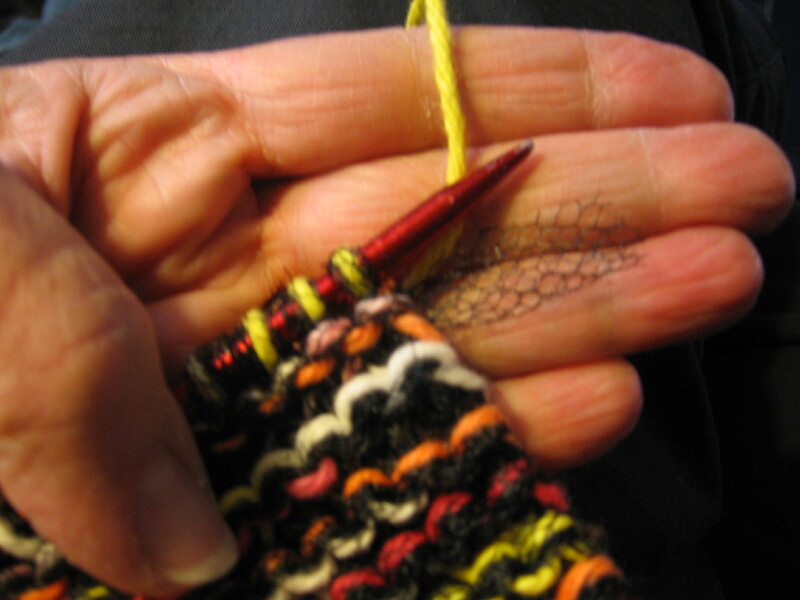 If you crocheted the long tail, unravel it now, and thread it into a tapestry needle. 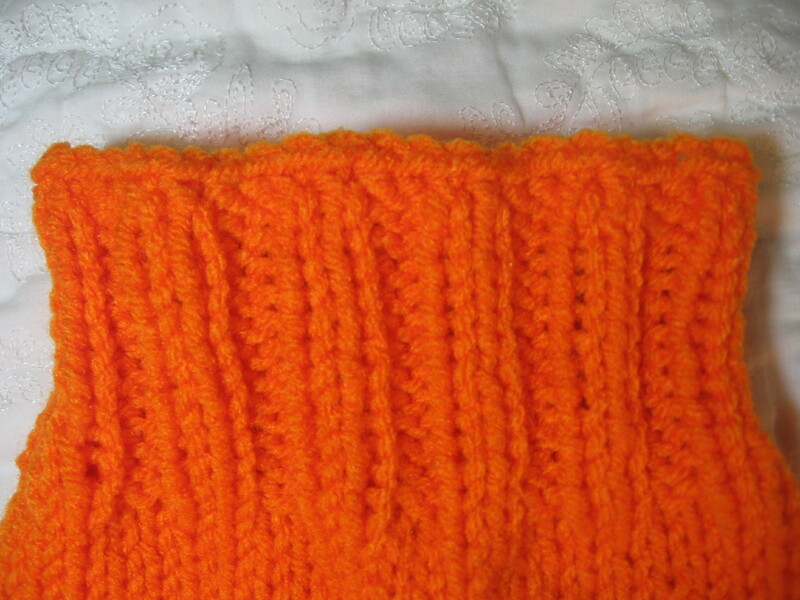 Stitch up the sides using the mattress stitch from the bottom edge of the ribbing up to the first row of purl stitches under the arm. Secure and weave in the ends. 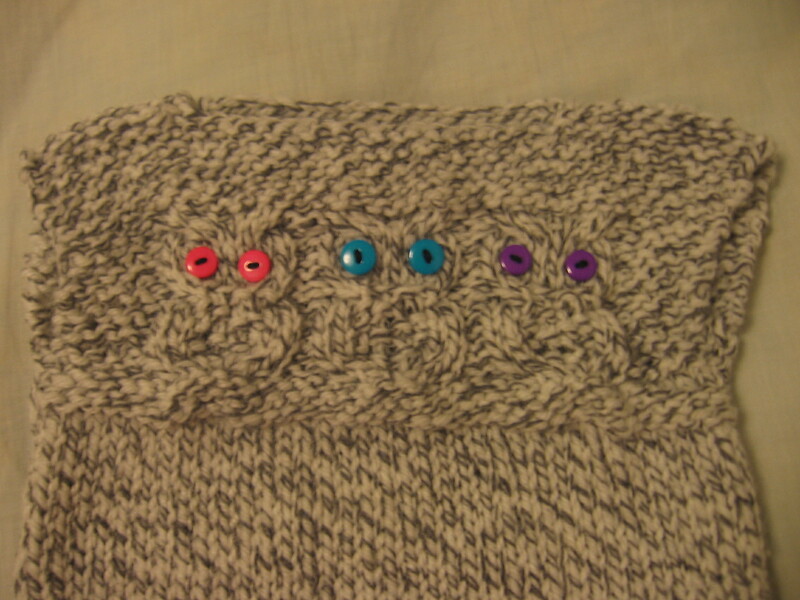 Turn inside out, and seam the shoulders along 9 (10) stitches from the outer edge, leaving a neck opening about 22 (24) stitches wide. 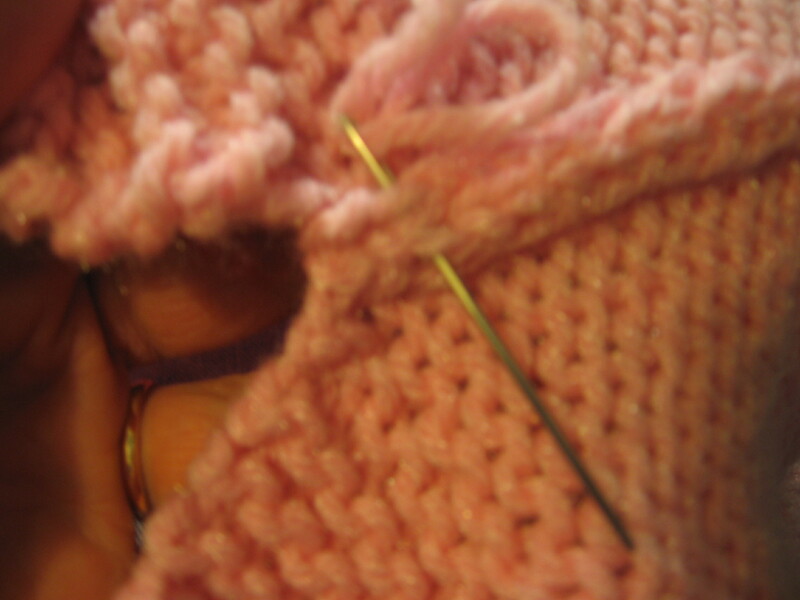 Reinforce the seam at the neck, and weave in the ends. 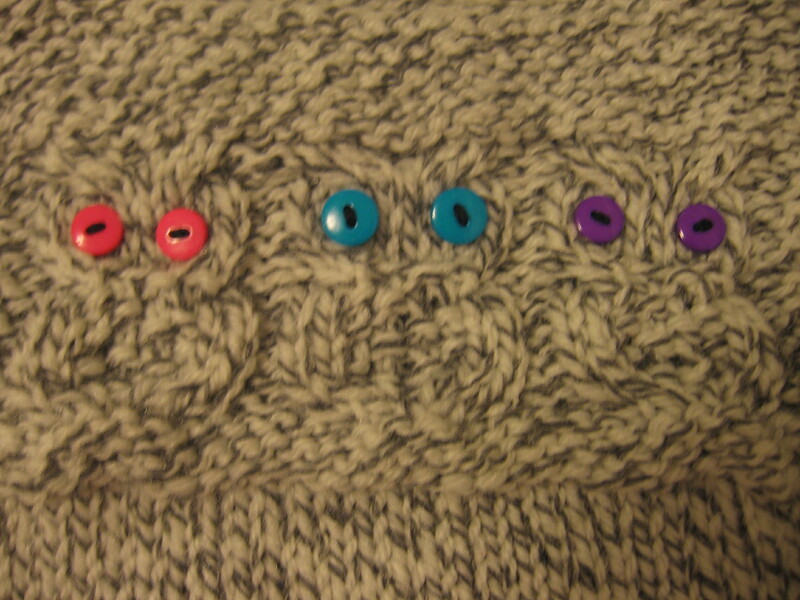 Finish the vest by sewing button eyes on each kitten. Here’s my inspiration. 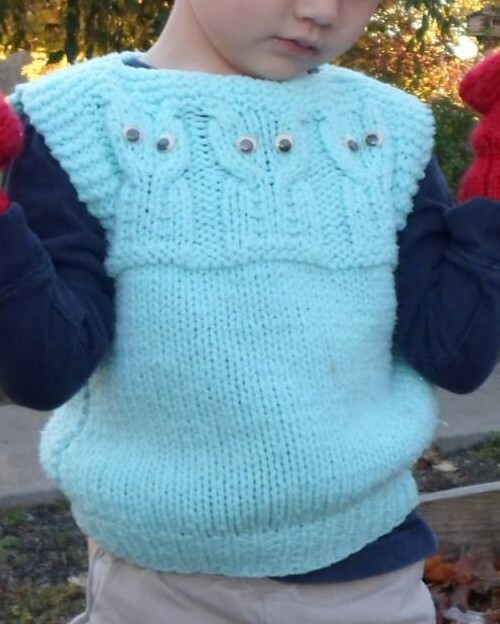 My grandma made this little sweater vest many years ago, now modeled by the daughter of my cousin who wore it long ago. 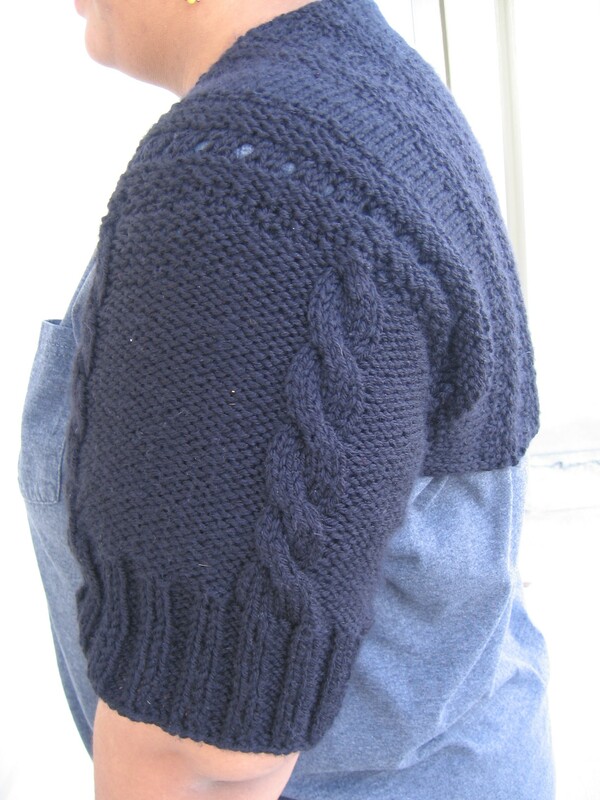 I’m somewhat new to making cables, but I thought it would be fairly simple to “pick off the pattern” as there are no sleeves or decrease rows for the neckline. 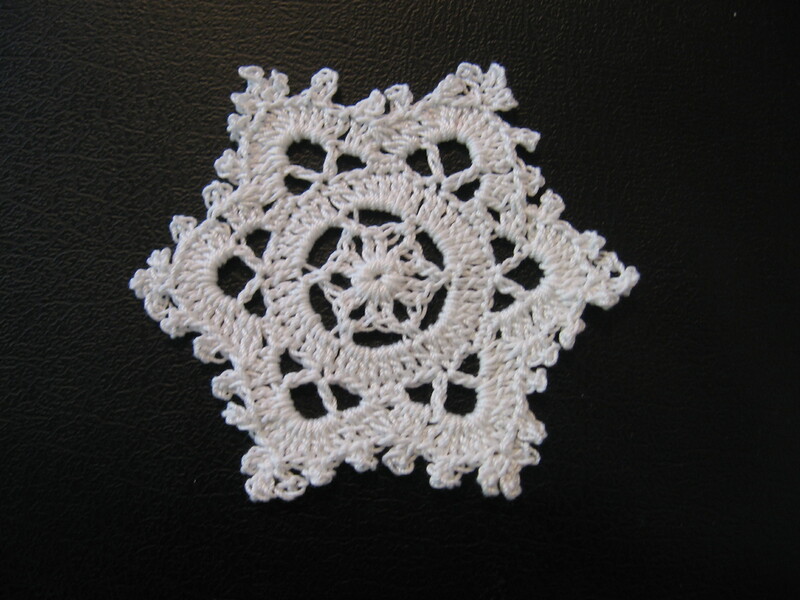 My first attempt was interesting–harder than I thought to actually write down the pattern. 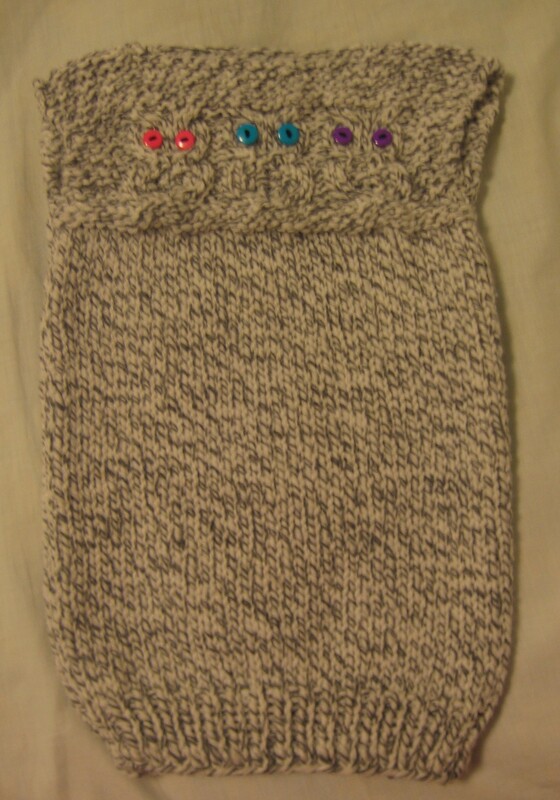 I could easily see what I needed to do, but couldn’t quite figure out how to document each stitch for others to follow. I thought the gray and white would be cute for the “woodsy” pattern. It makes it a little harder to make out the form of the owls, still, you can sort of see them. 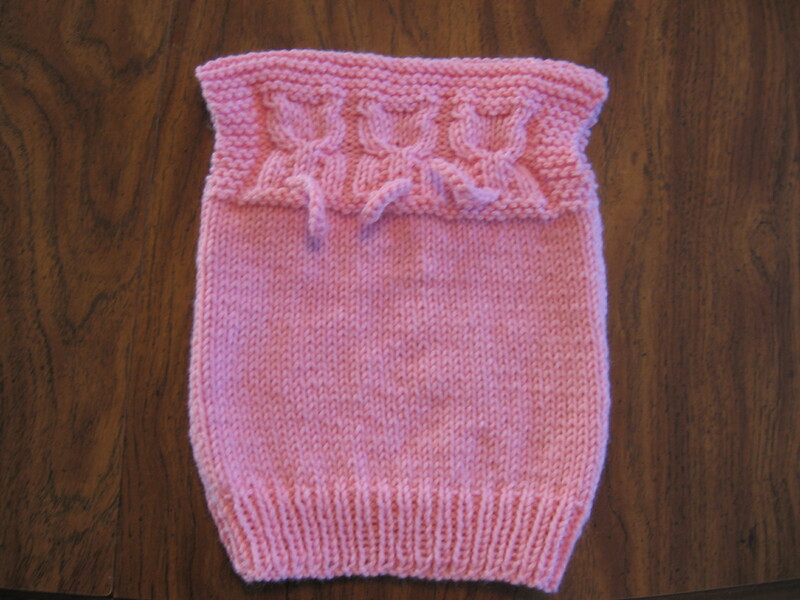 I decided to make the vest a little longer to be a “dress” for my year old niece’s birthday. 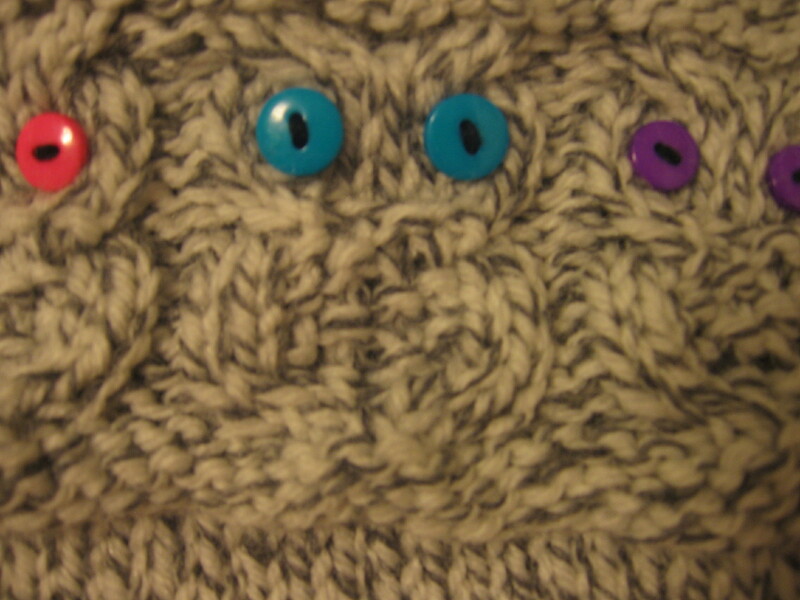 With the colorful buttons I chose for the eyes, I think it will be cute with long sleeves and tights of any bright color, white, black, or gray. 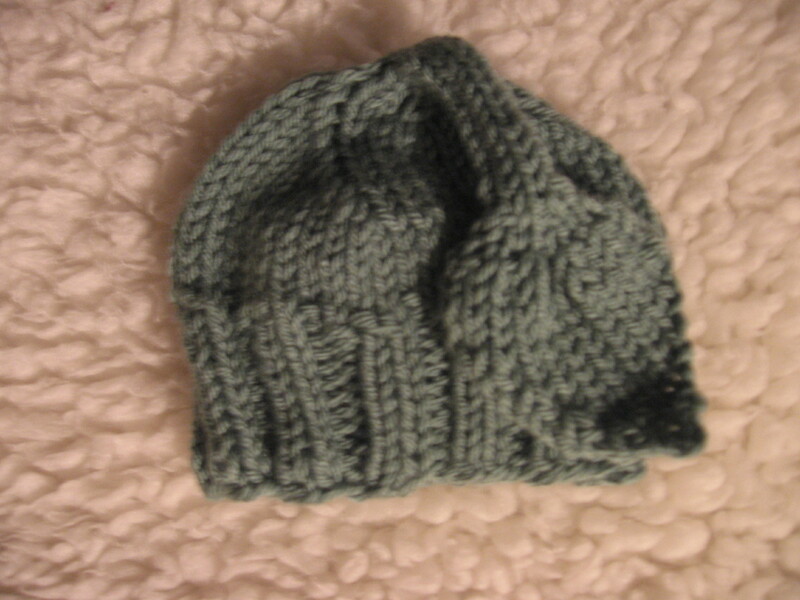 I cast on 40 stitches, then had to determine whether to knit from the top down, or up from the bottom. 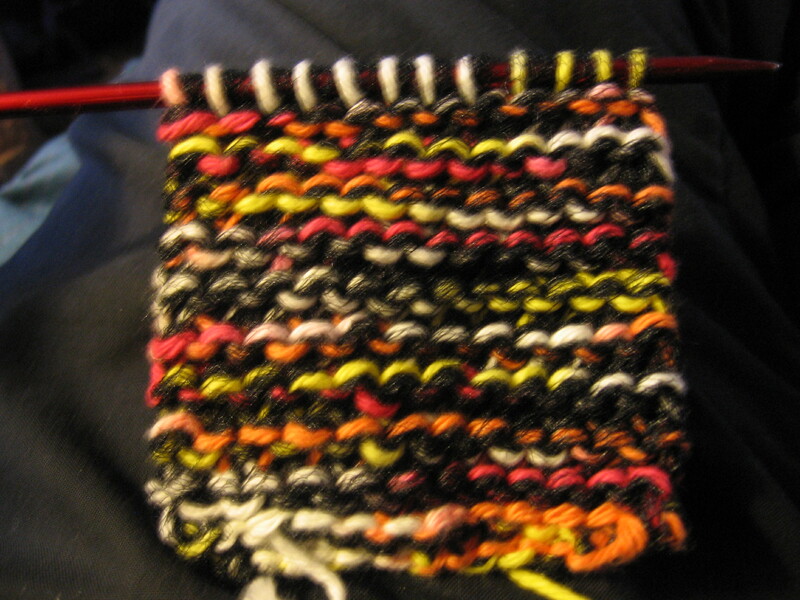 I decided to start with 8 rows of ribbing first, then continued knitting in the stockinette stitch for about 10 inches–going UP. 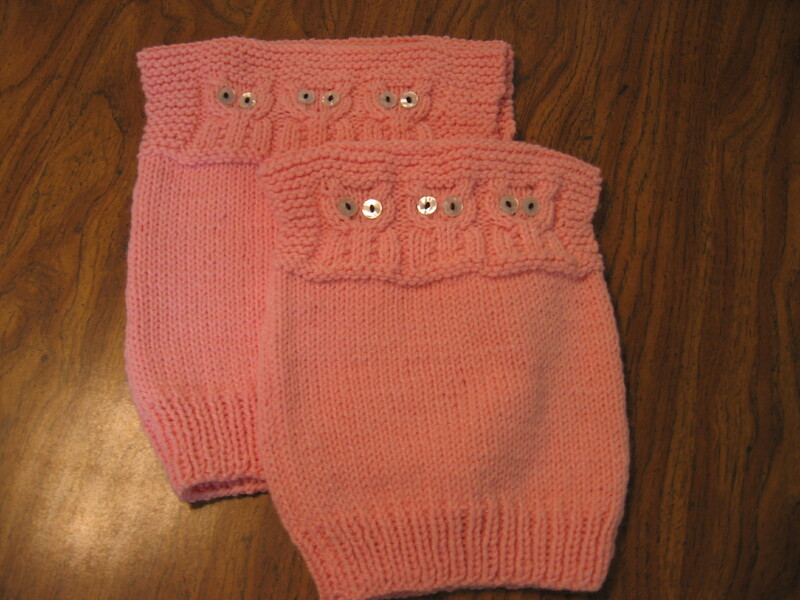 The owl pattern required about 18 rows, with four stitches of the garter stitch on each side for the sleeves. 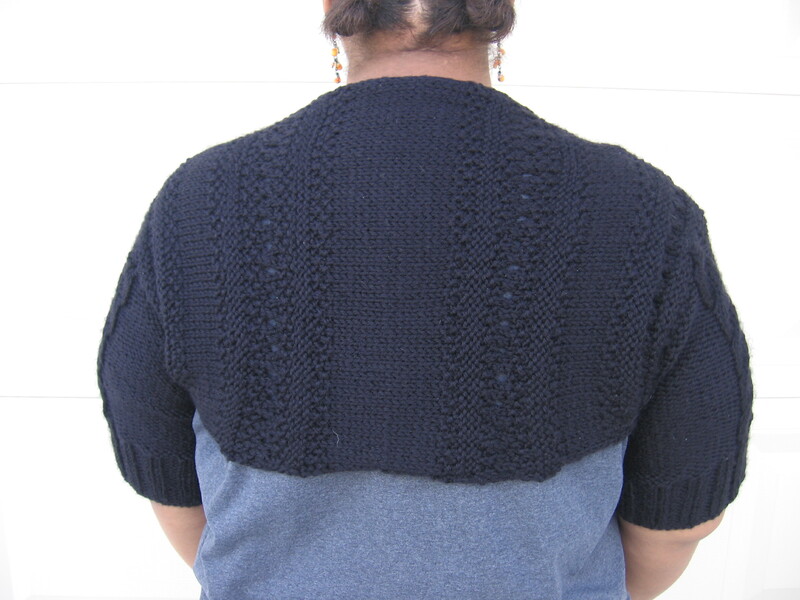 I finished with seven rows across the top (shoulders and neckline). 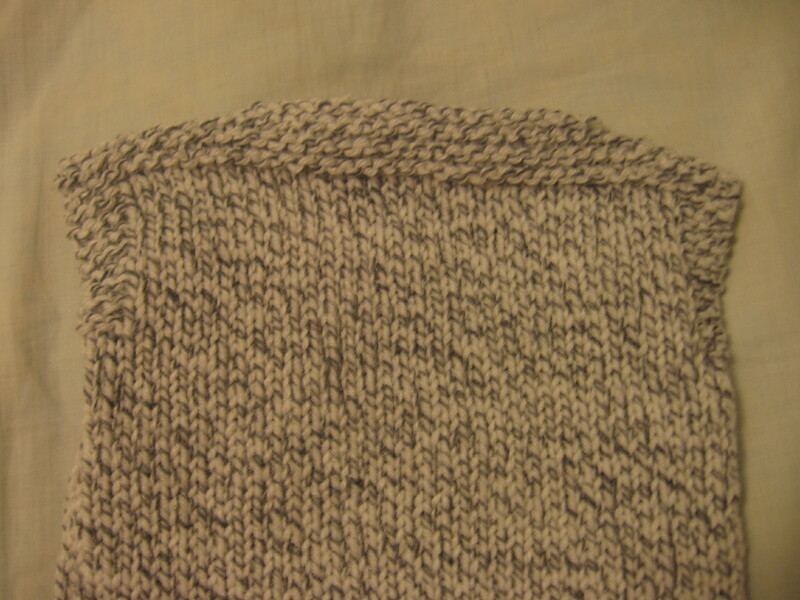 For the back, make the ribbing and stockinette stitch up to the sleeve opening, then the garter stitch along the 18 rows that were the owl pattern on the front, and seven more across the top to form the edge that will be the sleeve openings and neckline/shoulders. The seam down the sides was “like cake” using this tutorial from (you guessed it) verypink.com. 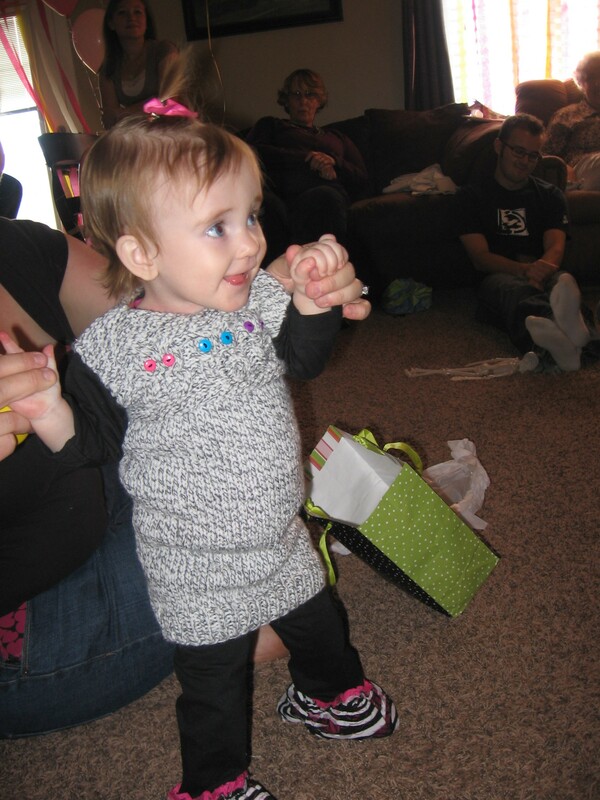 Here it is on my live “yearling” model at her birthday party. And here’s the Happy (Hungry!) Birthday Girl stripped down for birthday cake. Can’t eat cake like this with a new dress on. Coming soon: an actual pattern for the original vest. And–surprise! They aren’t really owls. 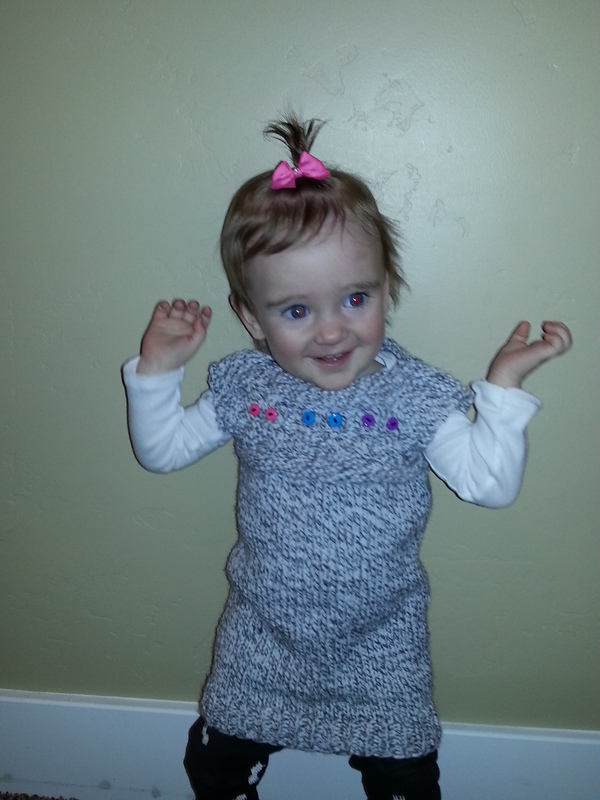 UPDATE: PATTERN POSTED HERE. HAPPY KNITTING! I recently finished this baby afghan that I gave to some friends who just moved, for the first time in their lives, to a climate where there is snow. They’re due to have their first baby in a couple of weeks–in perfect time for winter weather to set in. I’m afraid they are going to be very surprised to experience, first hand, how frigid it’s going to get! They taught me the word for RAINBOW in Portuguese: ARCO IRIS–same as in Spanish. I wish the photo had turned out a little truer to the actual colors of the afghan. It really is an eye-popper! 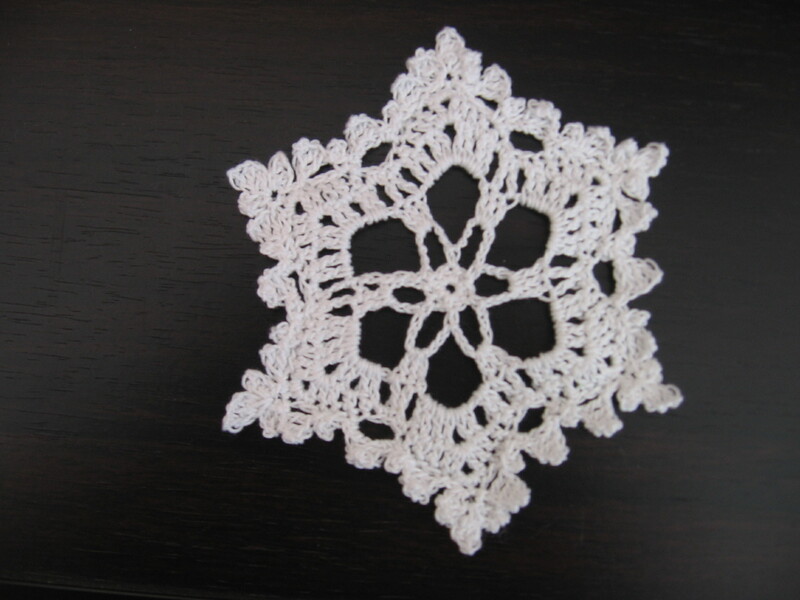 I don’t know the real name for the stitch I used, because my grandmother called it the popcorn stitch, but it’s not the one you’ll find in crochet directories. 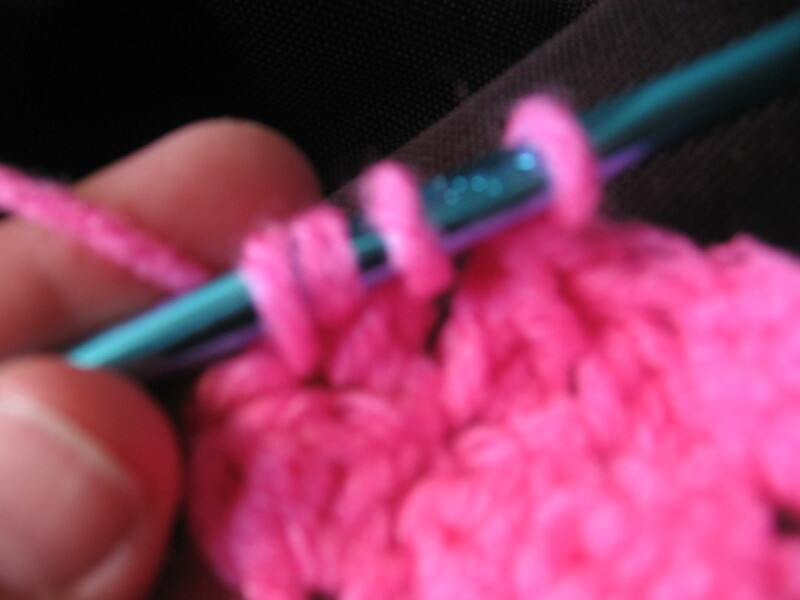 It’s especially nice because it moves quickly and gives my work a lush fullness I don’t get with a double crochet stitch. It’s especially nice if your tension tends to be loose. 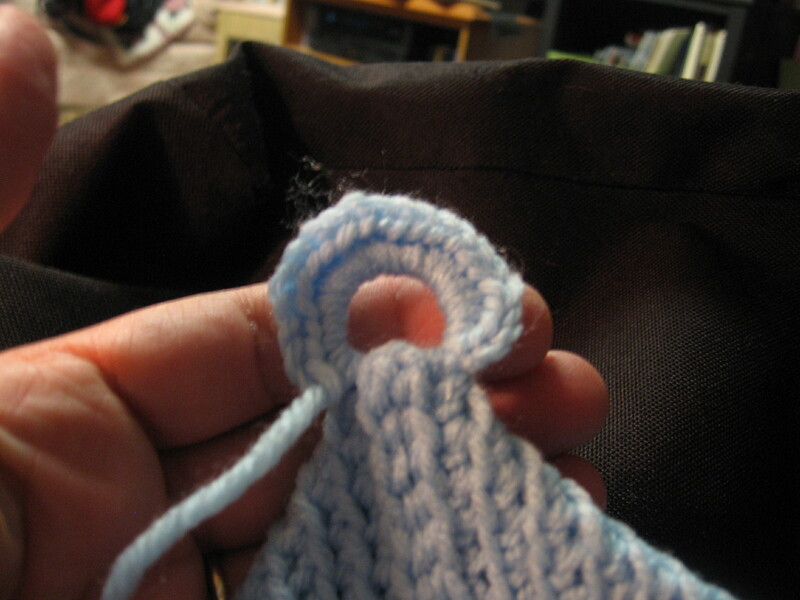 yarn over and draw the loop through two of the stitches on the hook (leaving two loops on the hook) Up until this point this is exactly like making a double crochet stitch. 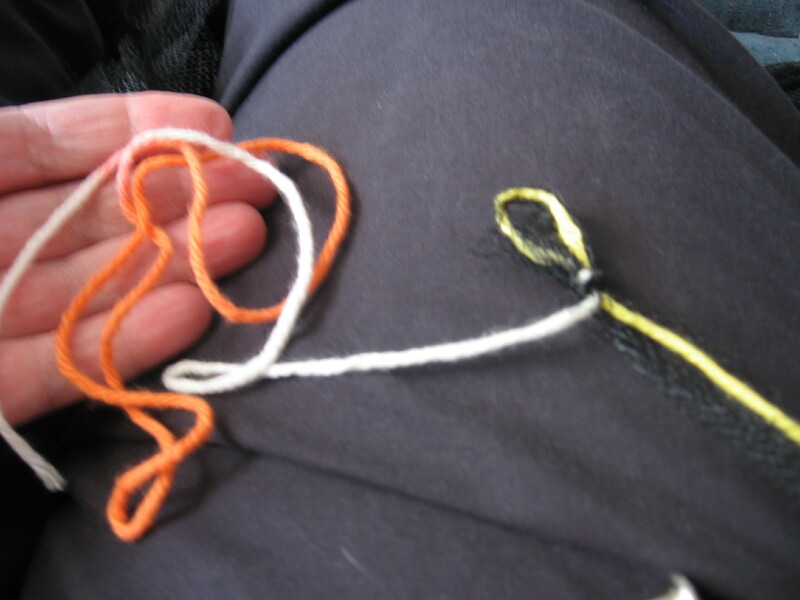 yarn over again and pull through the remaining two loops. 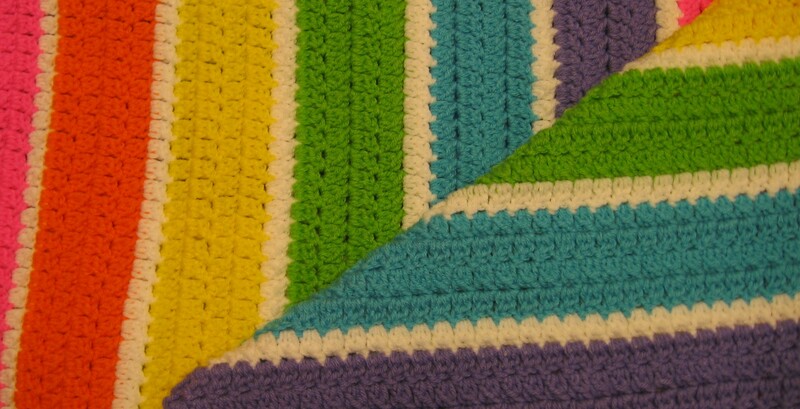 Whatever you decide to call the stitch, it’s beautiful, quick, and a lush choice for an afghan. 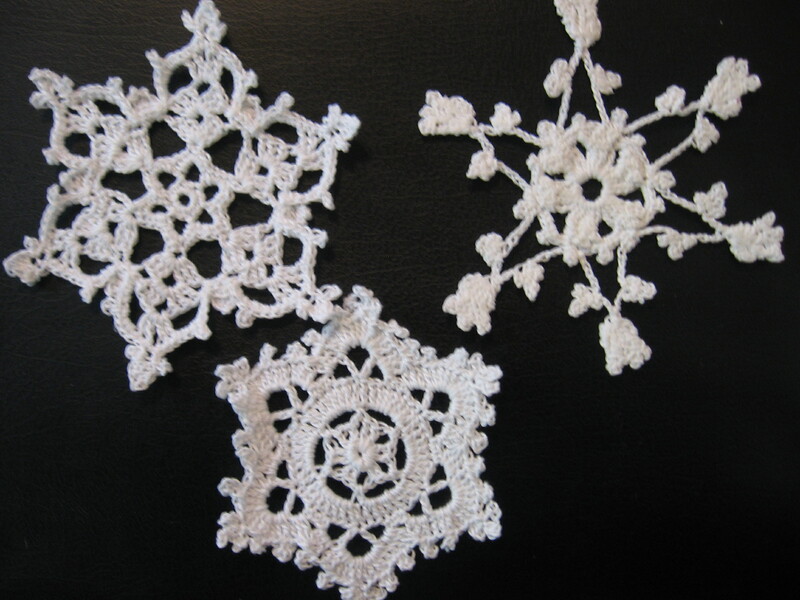 I especially love it because you don’t have to concentrate on your pattern, so you can enjoy the company of your family while you work on it. 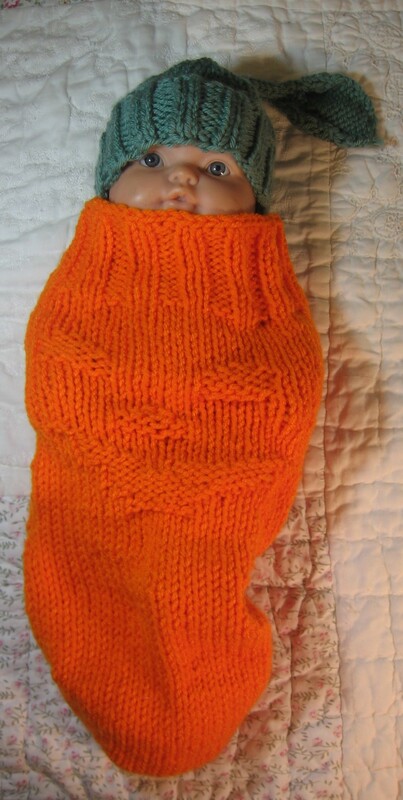 This is the second of two posts on how to knit a Newborn Pumpkin Stocking and Leaf Cap for newborn photos or baby’s first Halloween costume. If you haven’t taken the opportunity to see part one: The Leaf Cap, here’s the link. I’m sorry to say, I haven’t found a live model yet. I am too impatient to wait any longer, so I hope you can imagine that this doll is a real baby. The doll is a little small, but the stocking is stretchy and is intended to fit snugly on your newborn. 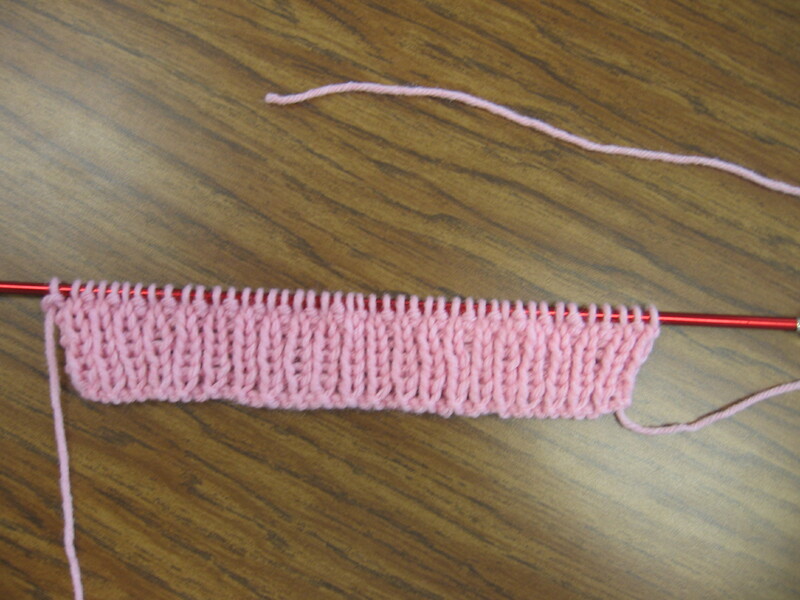 With a few noted exceptions, I follow the basic directions found on verypink.com for making toe-up socks, starting with the provisional cast on here. 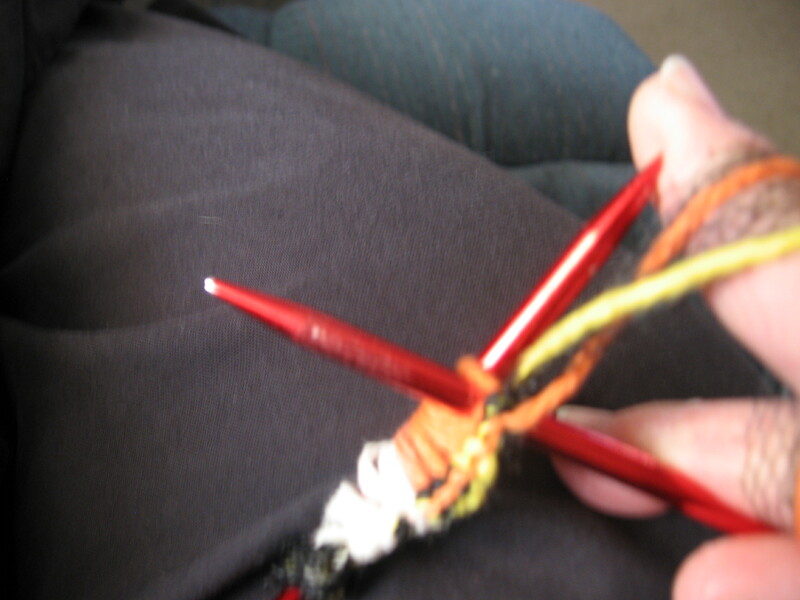 With a size H (or larger) crochet hook and a contrasting color of yarn, I make a very loose chain about 30 stitches long. 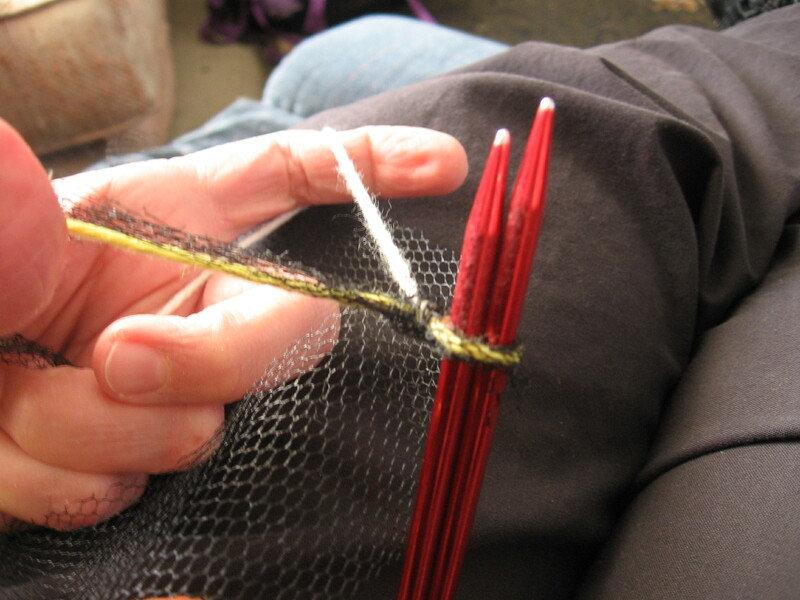 I find it easier to pick up all the bumps from the back of the chain stitch onto a knitting needle at once, knitting them off using both needles as shown in the pictures. 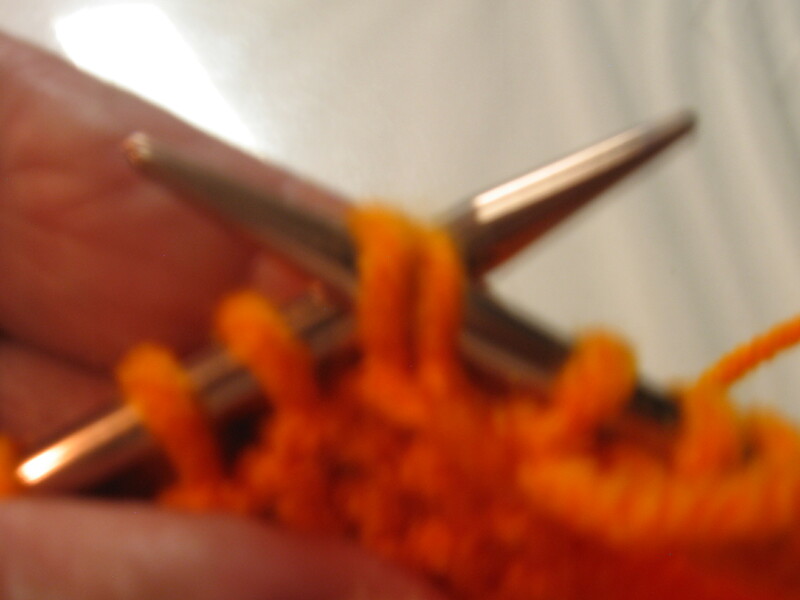 Notice the slant of the stitches on the needle. 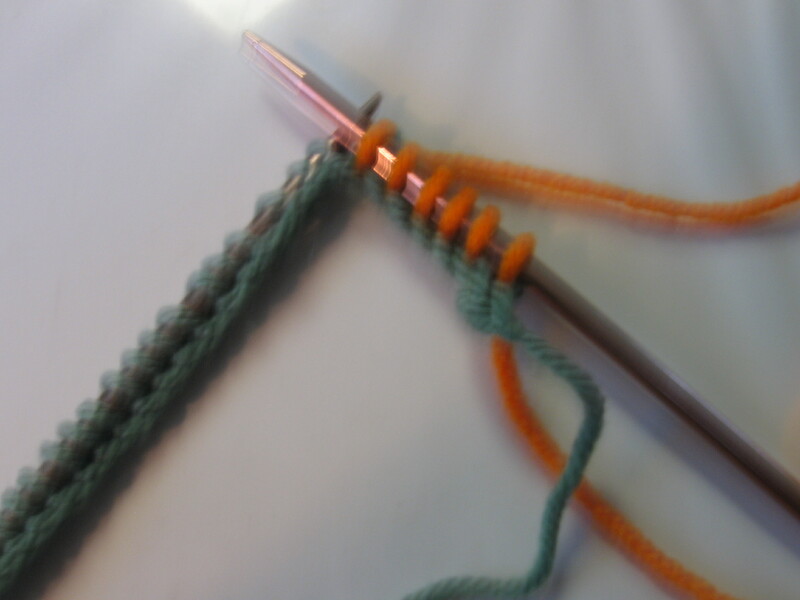 If you start on the end of the chain opposite from where you made your initial slip knot and insert your needle into the bump from the top right, the stitches will be loaded correctly. 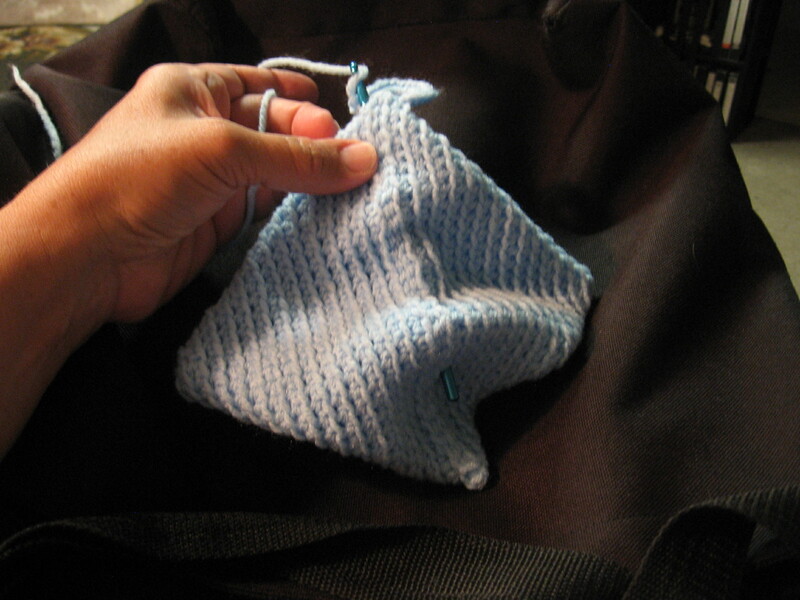 This is essentially the same technique as shown in the tutorial, except they pick up one stitch at a time. 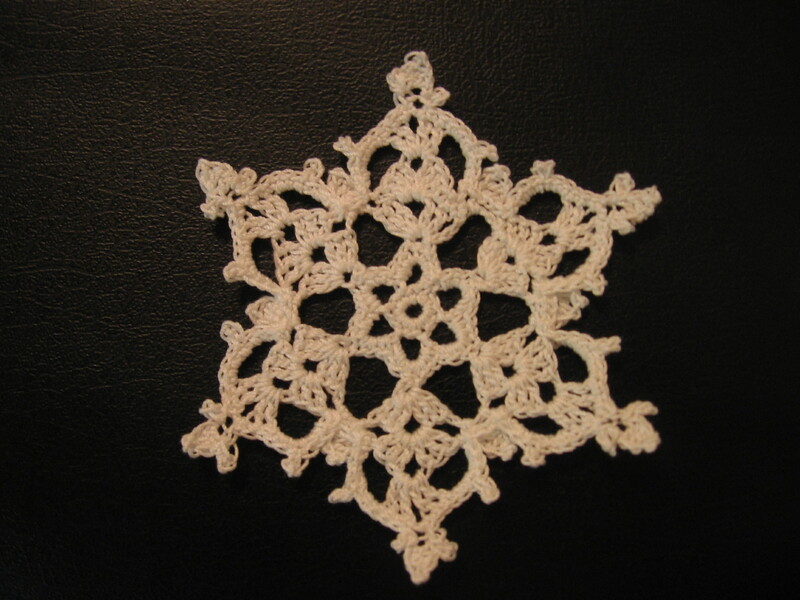 For this pattern, I cast on 24 stitches. 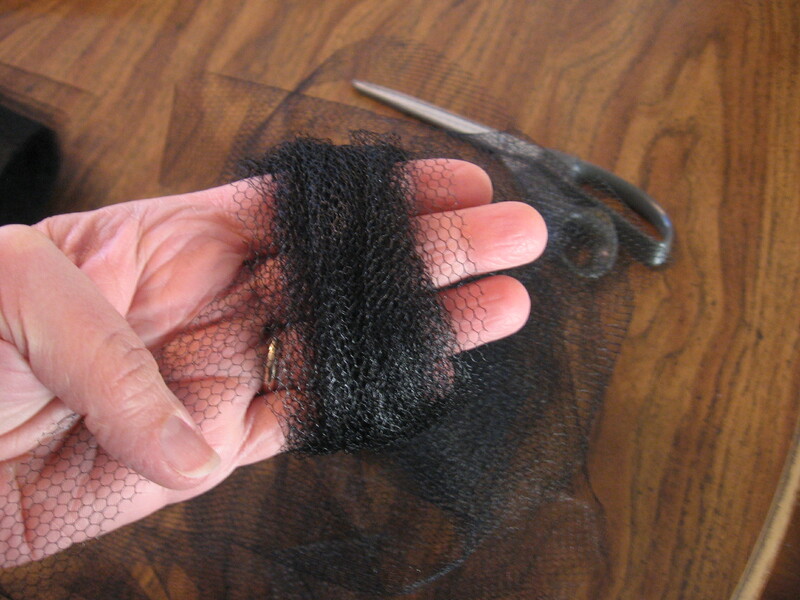 Wrapping stitches to make the toe (and heel) is really not as complicated as it may seem in the beginning. Look at the video a couple of times if you get stuck, but don’t give up! Wrapping allows you to add rows to the center of the row so you have tapered sides. 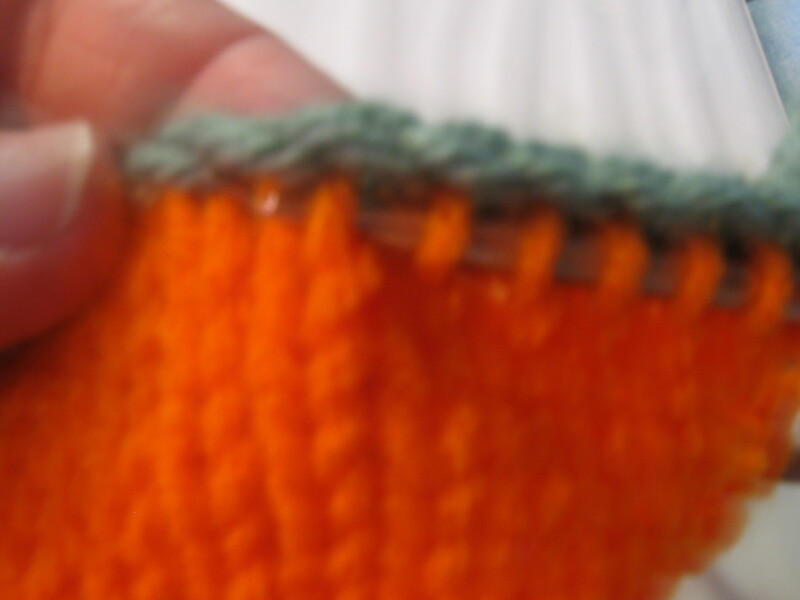 The wrapped stitches stay on the static needle while you add length to the middle of the rows. 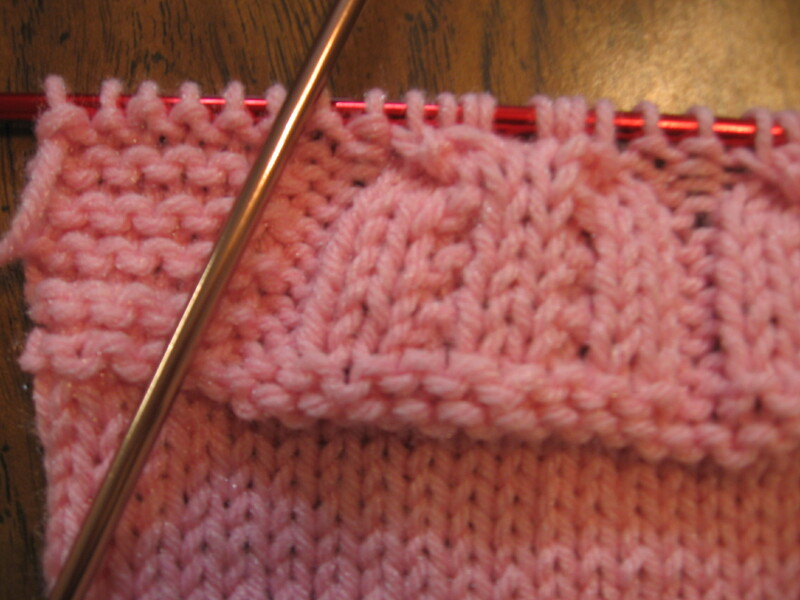 Wrap the ending stitch on each row until you have eight wrapped stitches on each side. 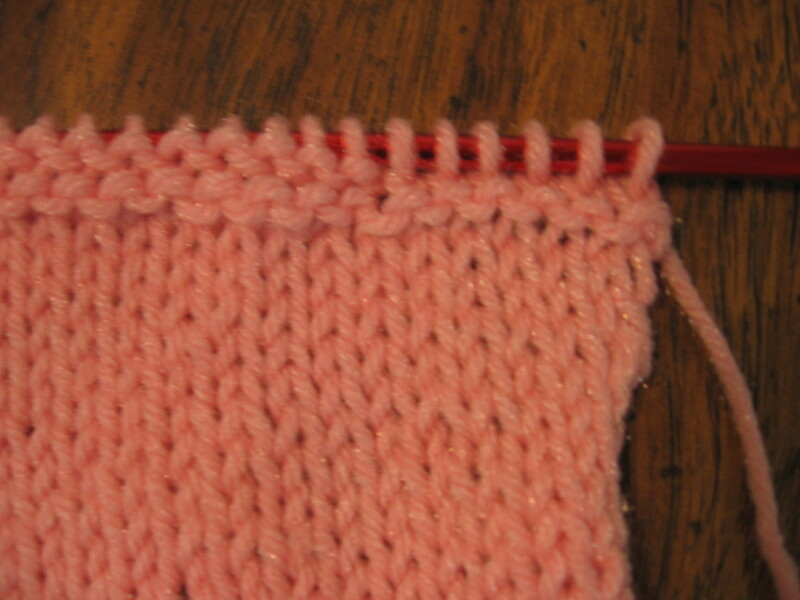 . .
Then you proceed to pick those tapered sides back up one stitch for each row of knitting. 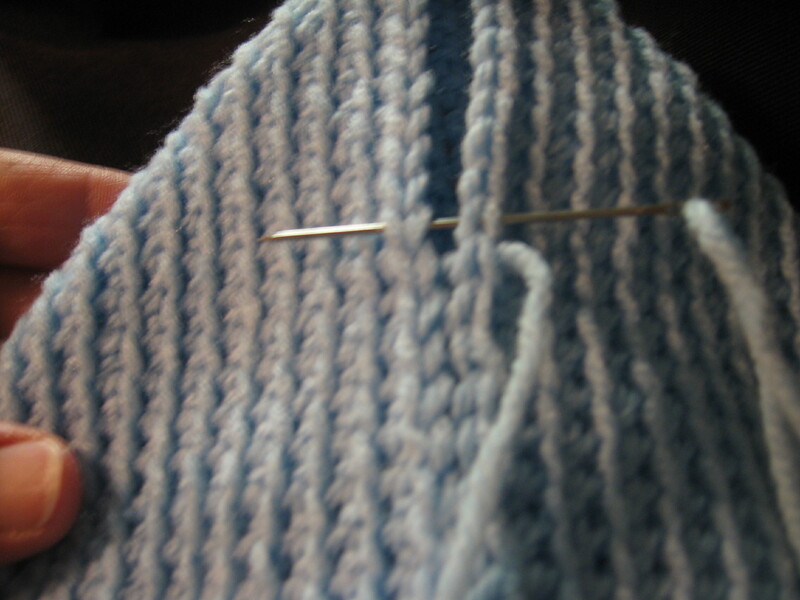 . .
. . .until you have picked up the entire row of stitches back onto the same needle again. 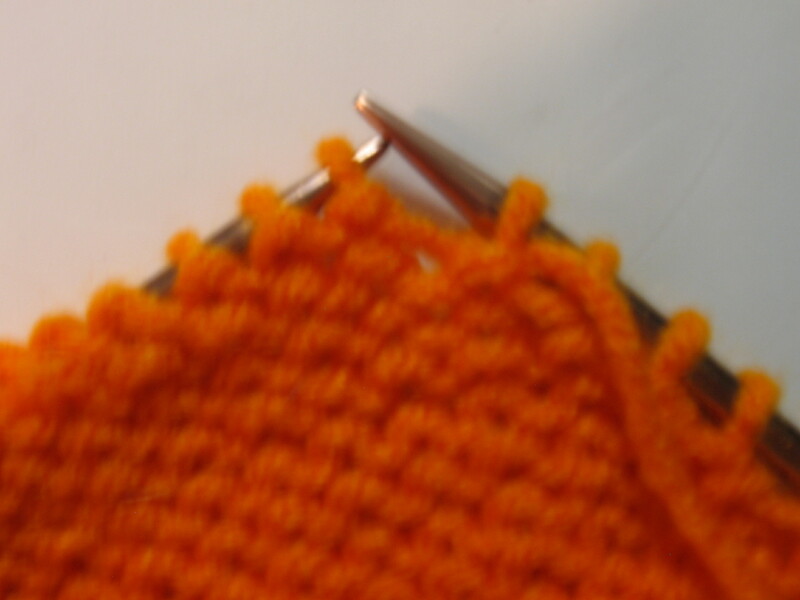 When you get to this point, you are ready to remove the chain stitch. 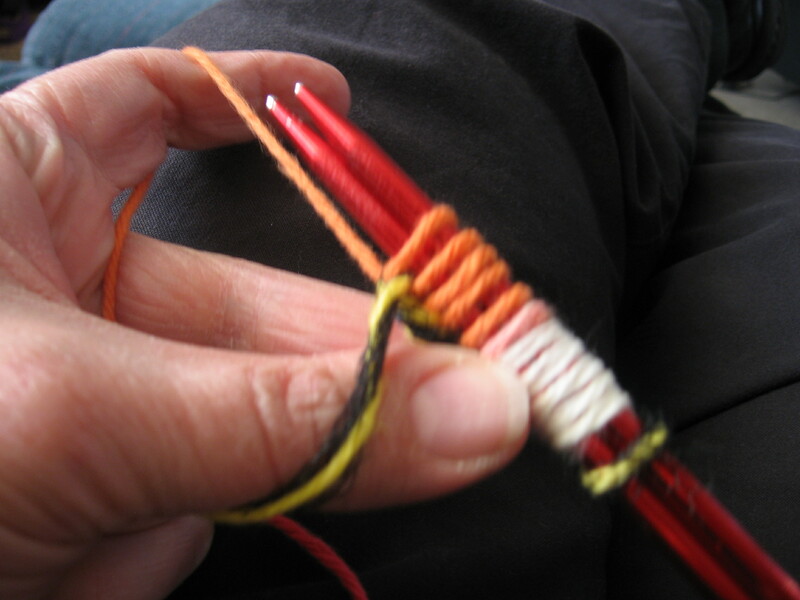 Insert your empty needle into the loops of 12 of the stitches joining the contrasting chain, as shown, and 12 on a second needle. 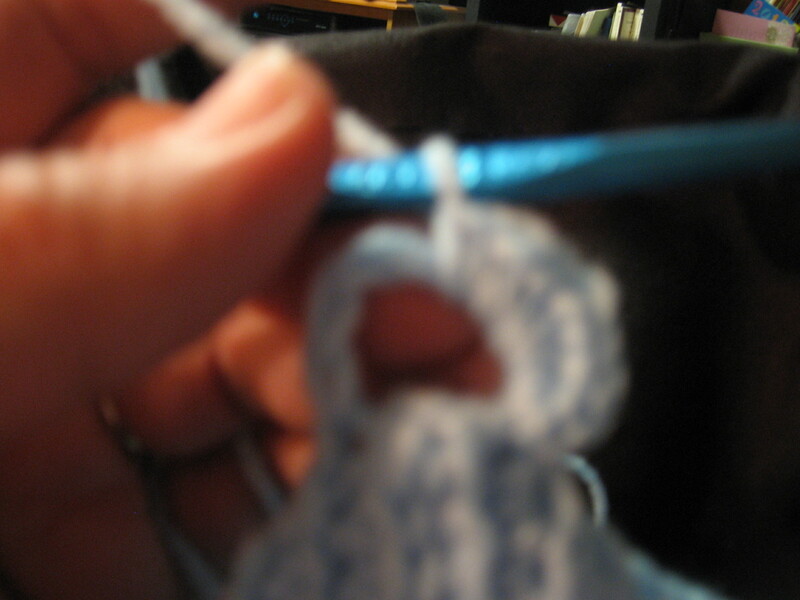 Though it’s a bit fuzzy, you can see here, that the initial chain stitch easily “unzips” once the stitches have been picked up by the needle. 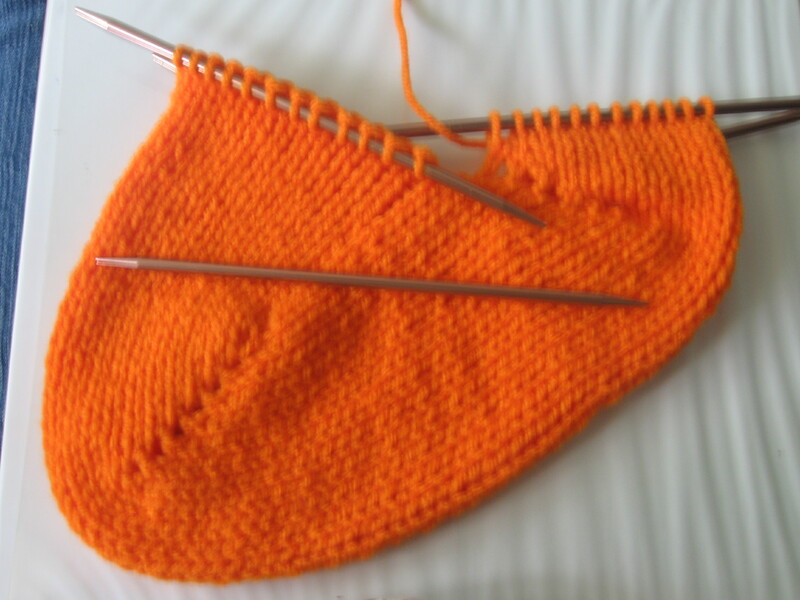 At this point you will have 48 stitches divided evenly (12 on each) between four knitting needles. You will be surprised to have a perfectly shaped sock toe! 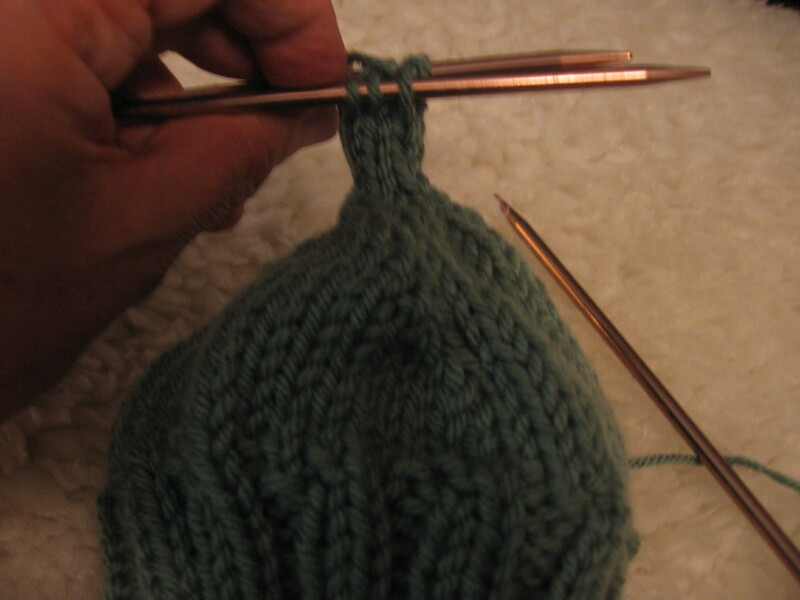 Begin knitting in the round and continue for about 14 complete rounds. 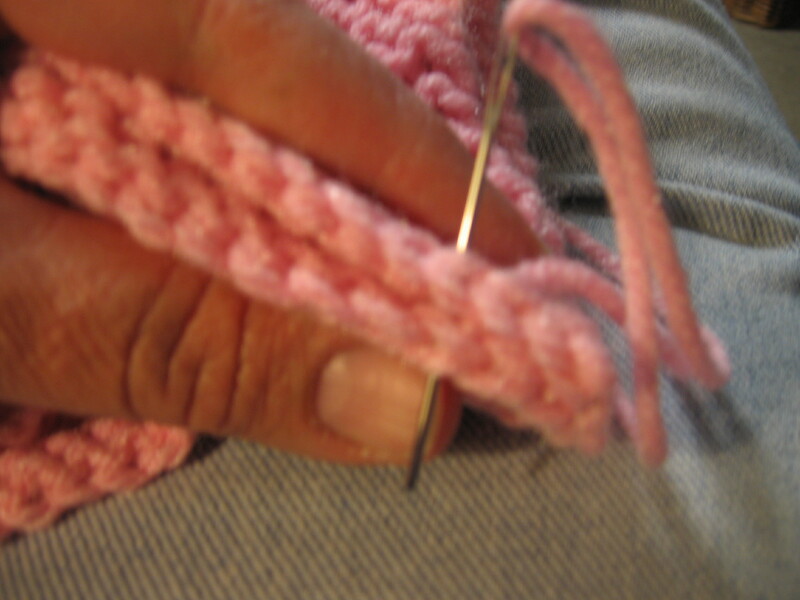 At this point you will consolidate 24 stitches onto one needle and repeat the process you used for the toe to make the heel (or in this case, the “Baby Bum Bump”) Instead of wrapping eight stitches on each row, this time you will only need six. 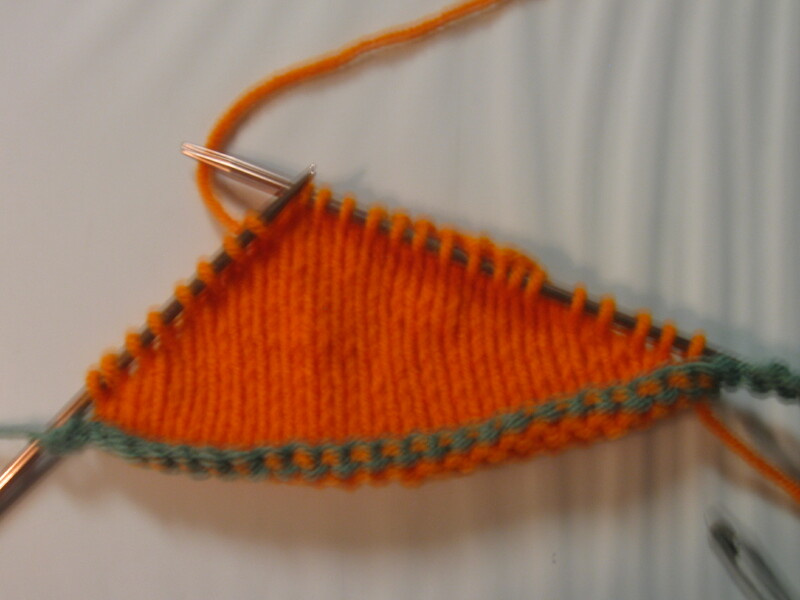 Using 6 wraps instead of 8 produces a more gradual angle in the heel of the sock. 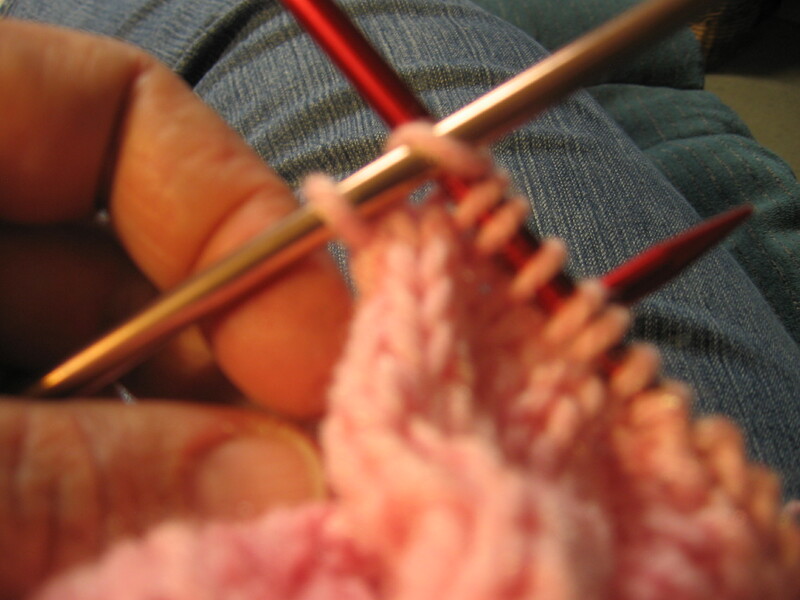 When the wraps are all finished you can re-distribute the stitches evenly on each of four needles again. 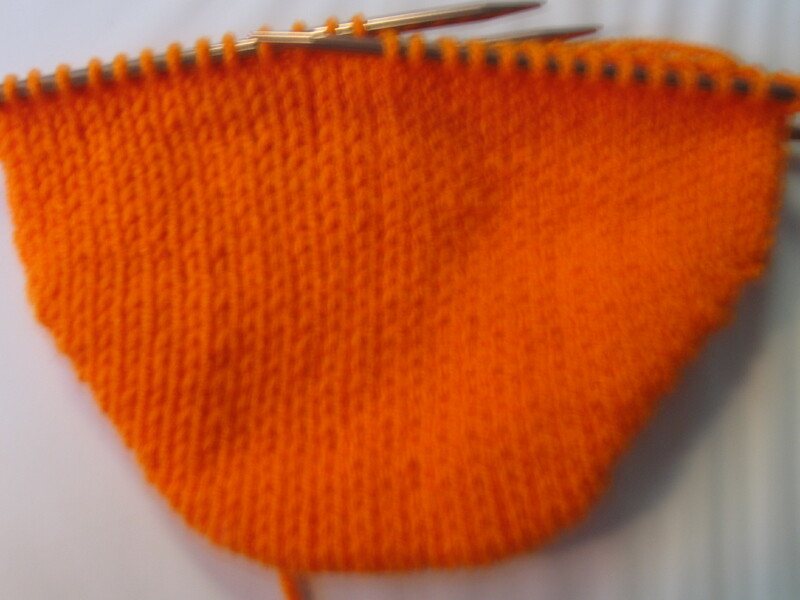 Continue knitting in the round until your little punkin’s bunting is the desired length (approximately 36 rounds). 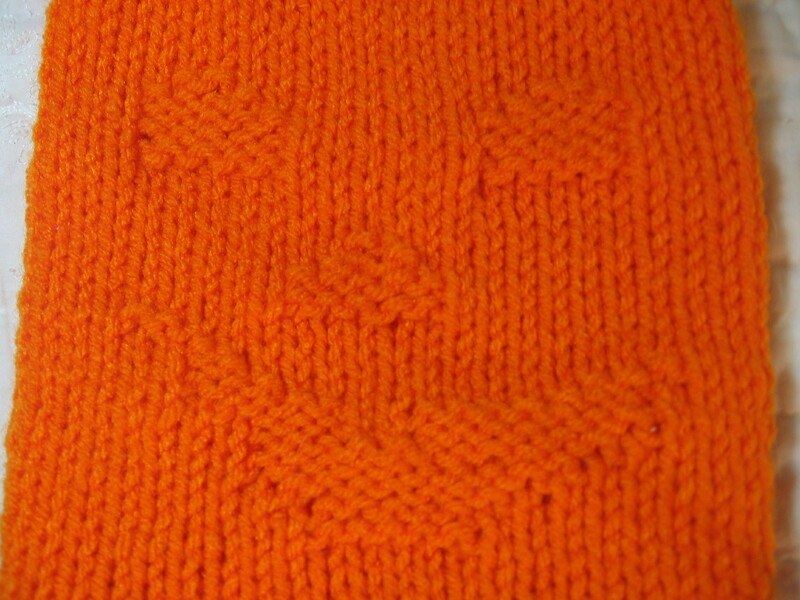 I used a very plain stitch with the exception of the jack-o-lantern face pattern made with the purl stitch centered on the front, but you could embellish with a knit/purl pattern of your choice. 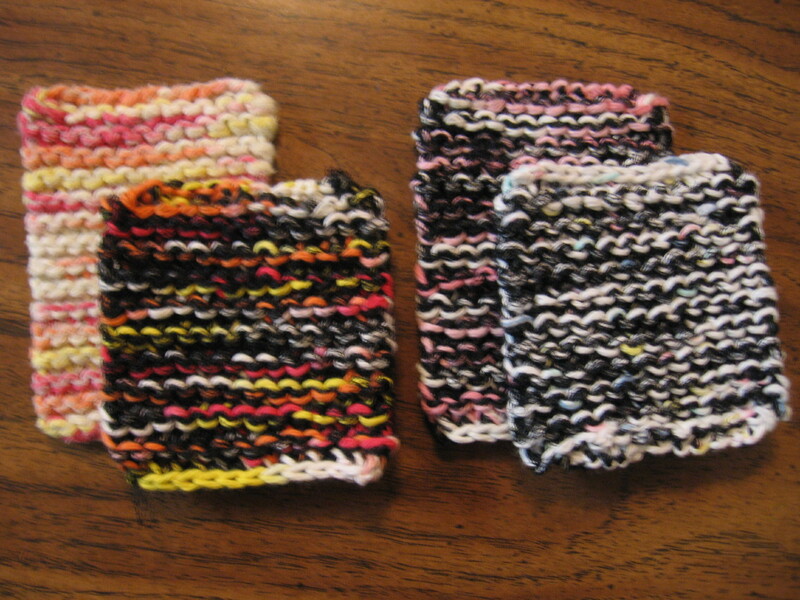 Finish off by repeating a knit 2, purl 2 pattern for 10-15 full rounds for the cuff. 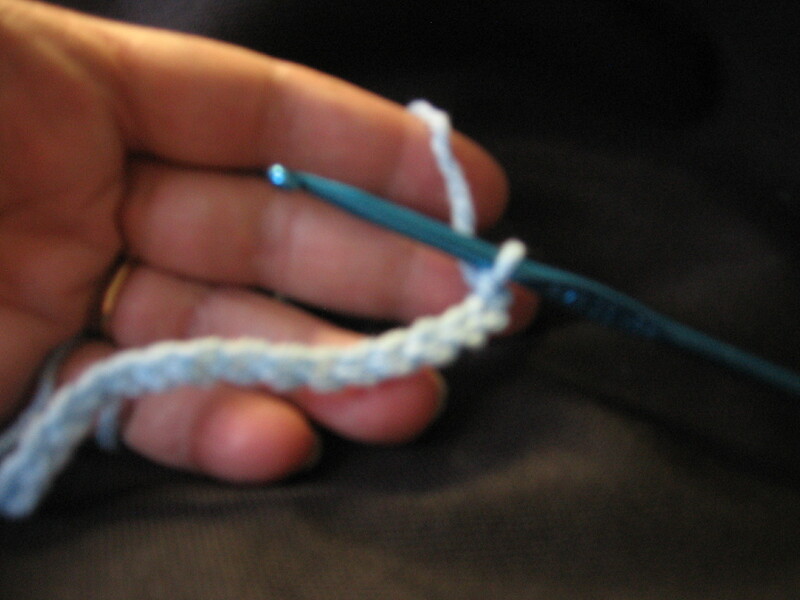 Cast off using your size H crochet hook and this technique. 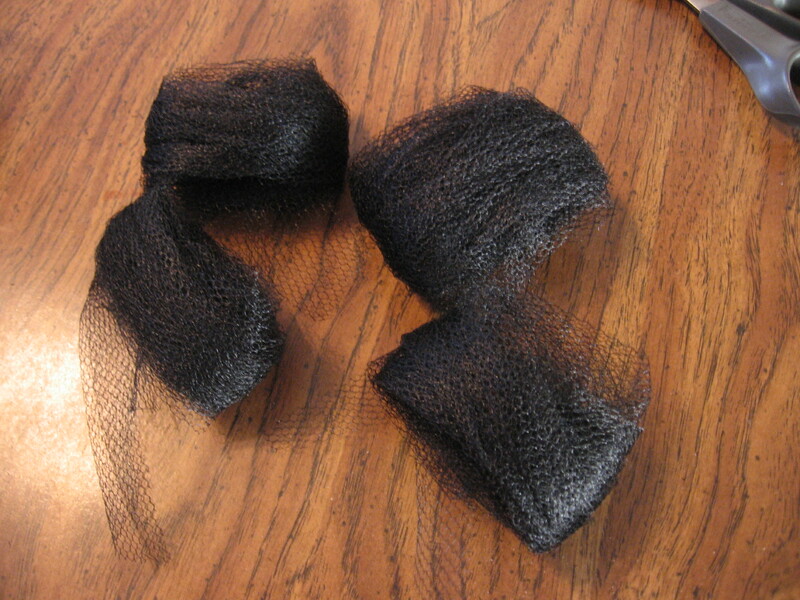 Weave in the ends. Snuggle your little pun’kin up tight in his/her first Halloween Costume. 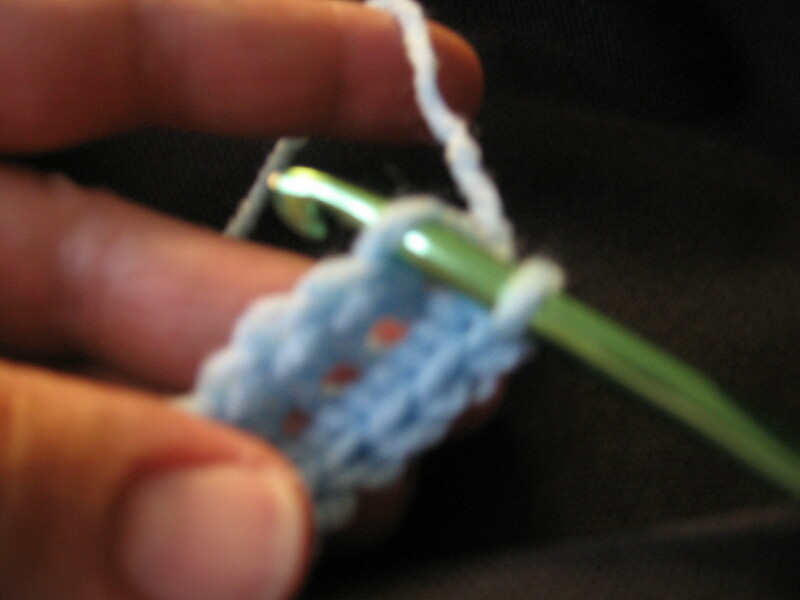 Using a size H crochet hook and worsted weight yarn, chain 39 stitches. 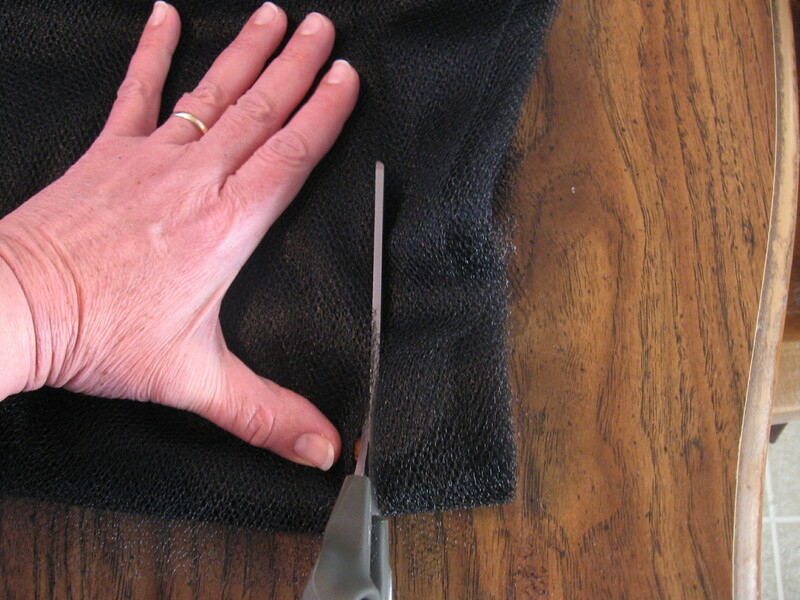 In order to produce a thick, protective Hotpad, your stitches should be fairly tight. 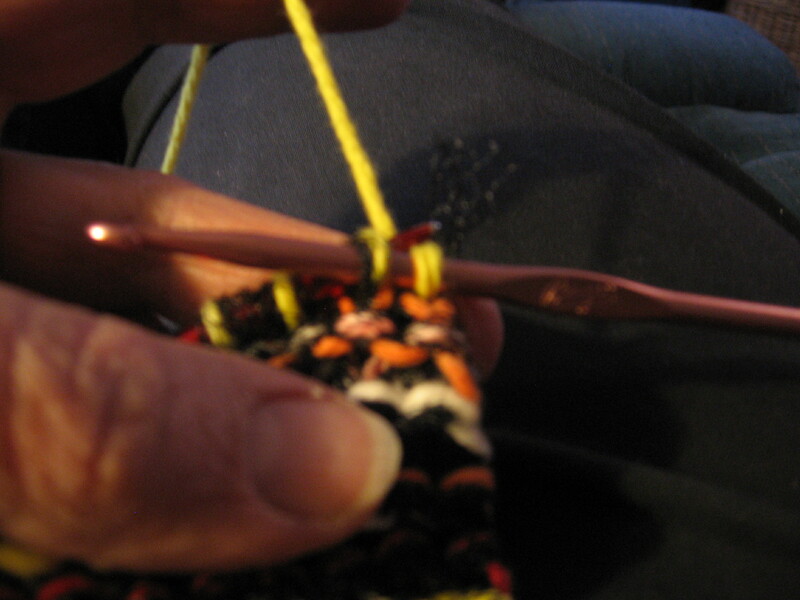 If your tension tends to be looser, you may want to consider a smaller hook and/or thicker yarn. 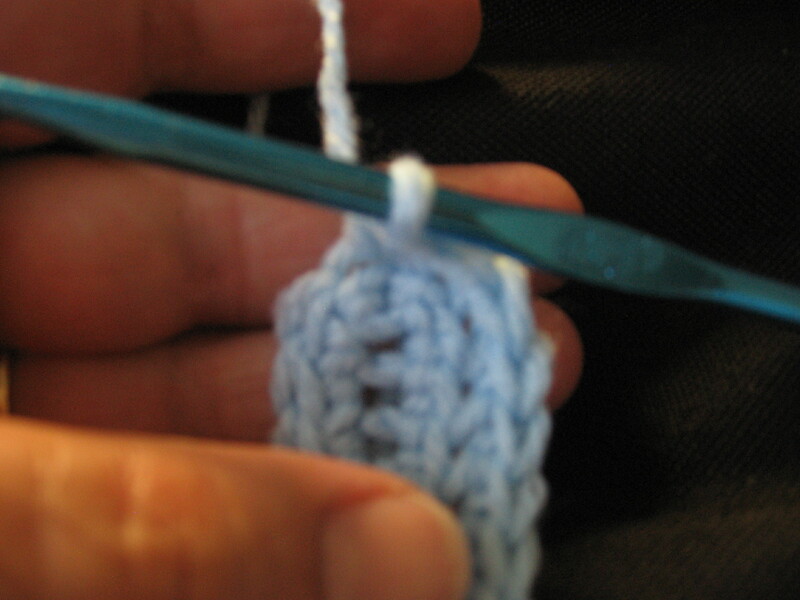 Single Crochet in each chain stitch, beginning in the second stitch from the hook for a total of 38 stitches. 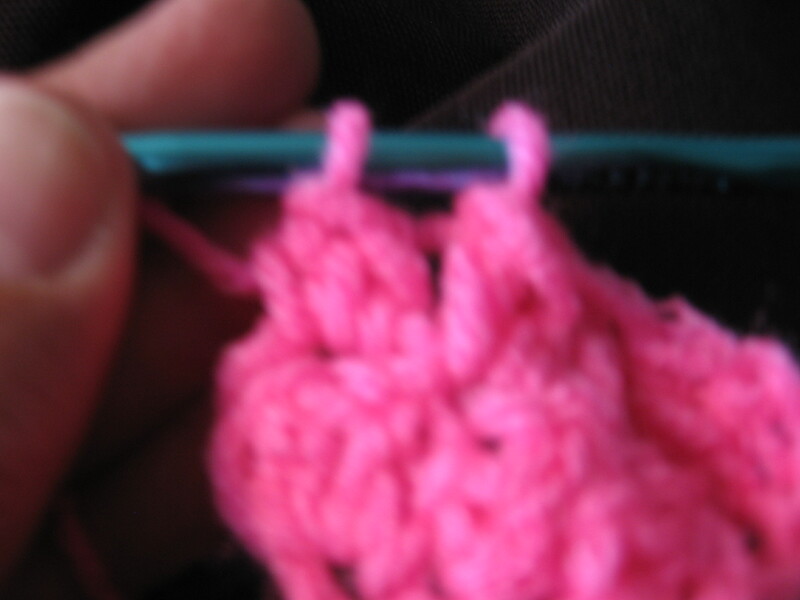 Single Crochet once again in the last single crochet stitch made, turning the corner and crocheting the unworked side of the initial chain. 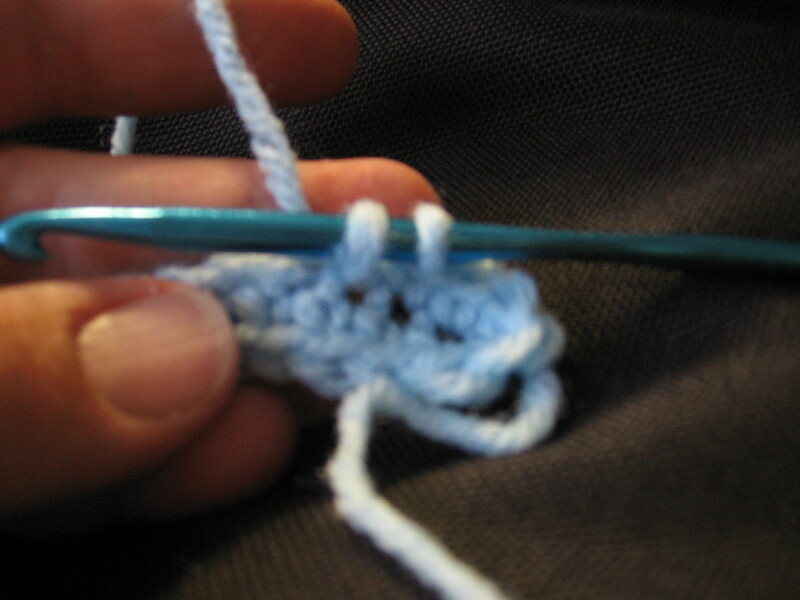 Continue Single crocheting for a total of 38 stitches on the second side of the chain. 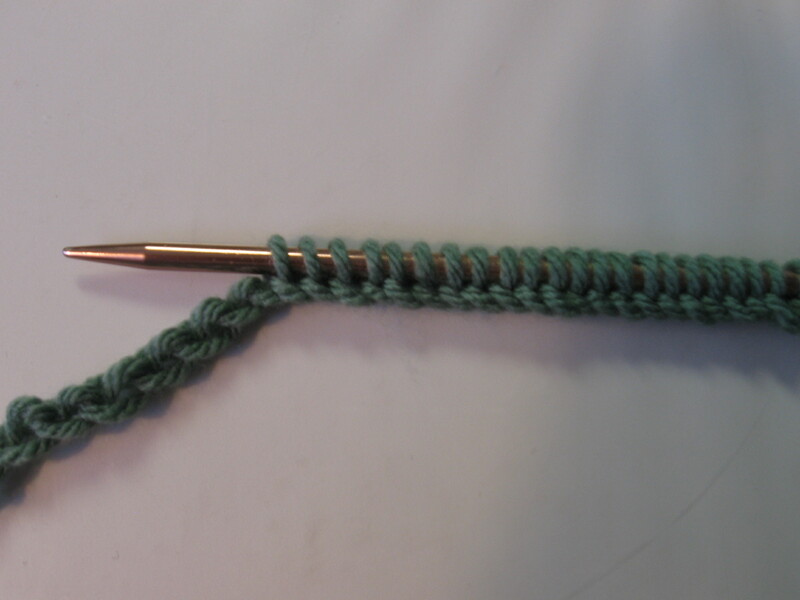 Without joining at the end of the row, make the next stitch in the back loop of the first single crochet stitch. 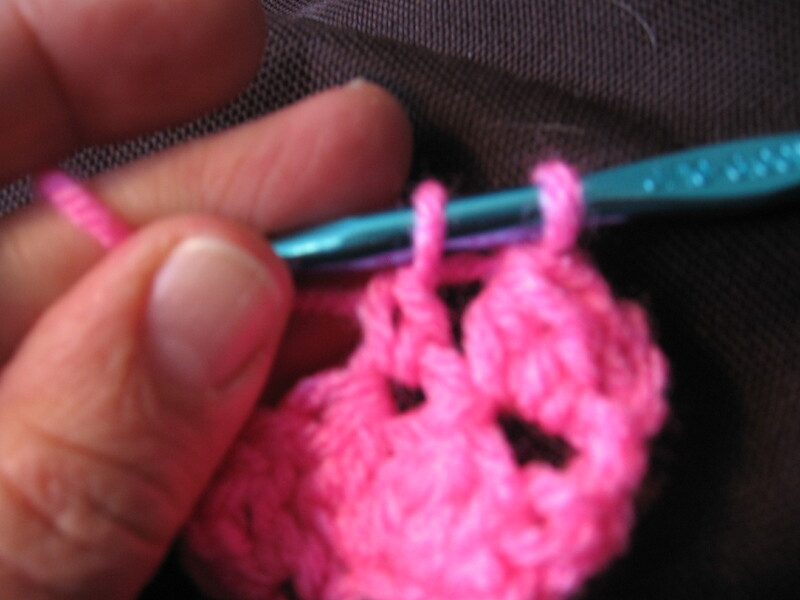 Continue crocheting in the back stitch of each stitch, around and around. 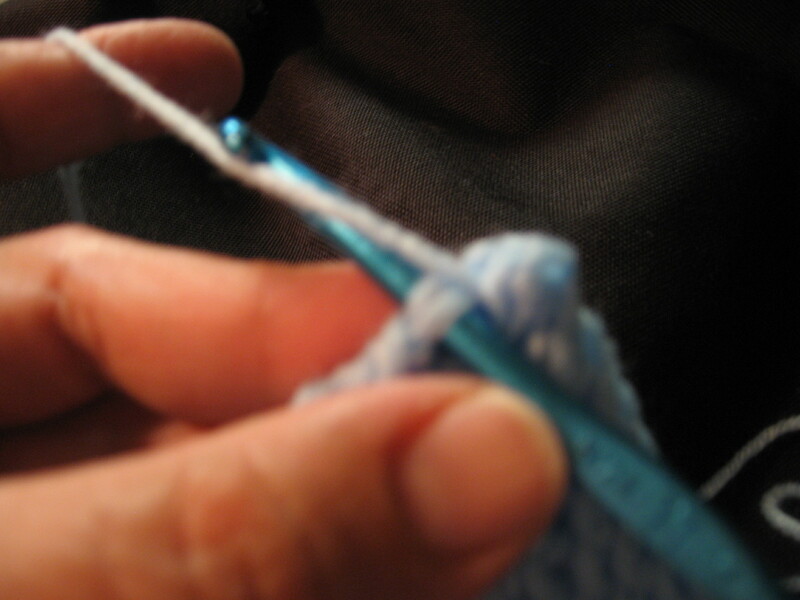 Since you made no joint at the end of the first row, your work will make a continuous “track” without any seam. 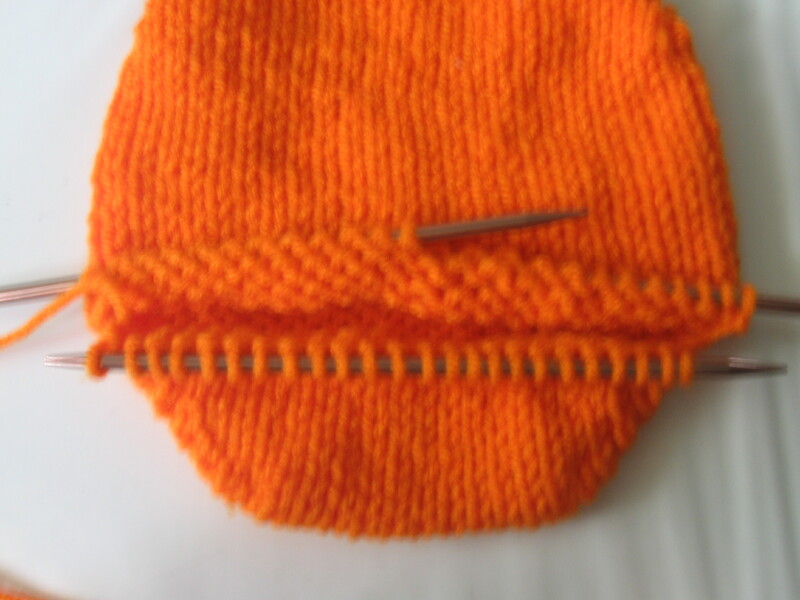 At this point you are working your stitches from the inside. . .
. . . At some point along the way you will find it easier to turn the corners of your potholder inside out and work from the outside instead. You’ll know the right side by the stripey ridges. 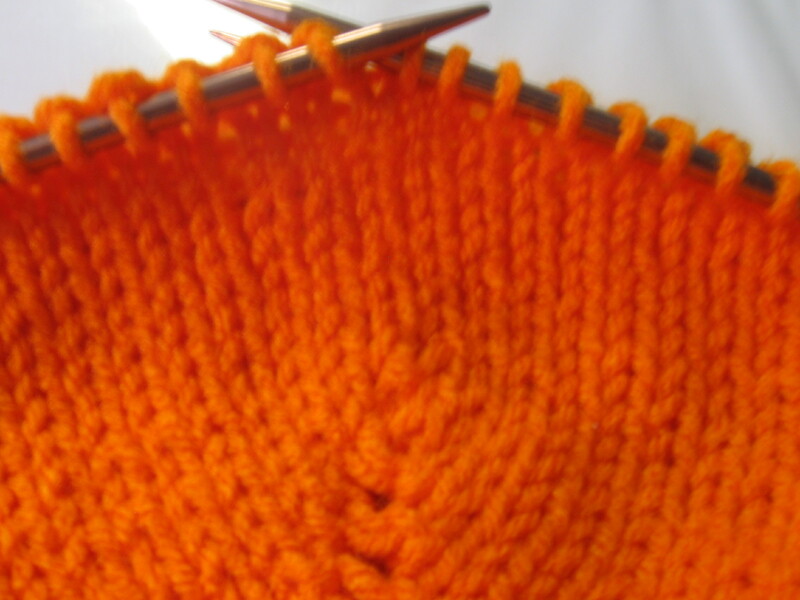 When you have somewhere in the neighborhood of 13 rows or so, you will need to begin checking to lay it flat and see if you have enough rows to make your seam. 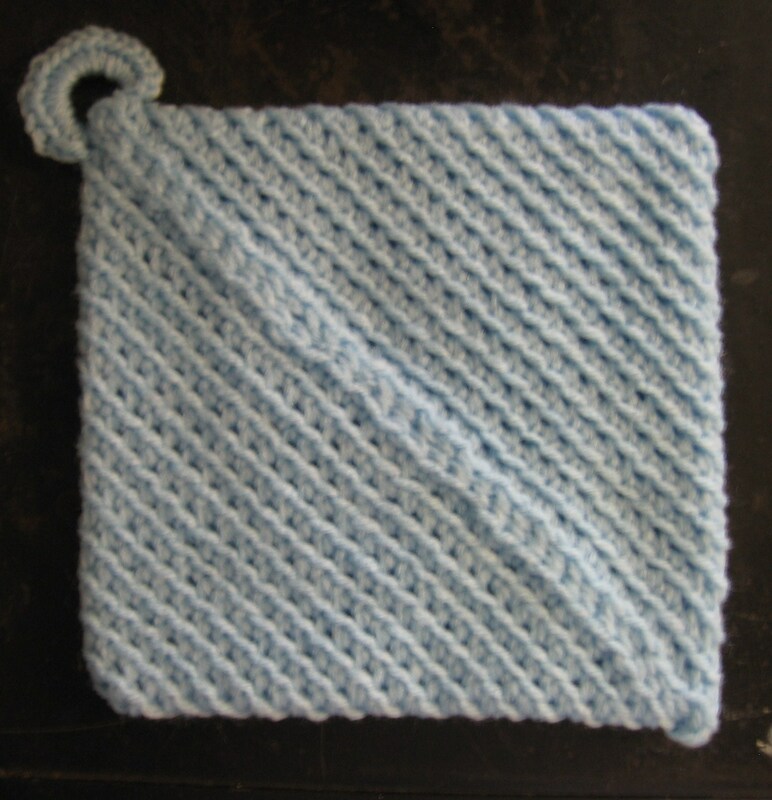 When your rows buck up right next to each other smoothly, you need to determine where to stop to make your pot holder square. 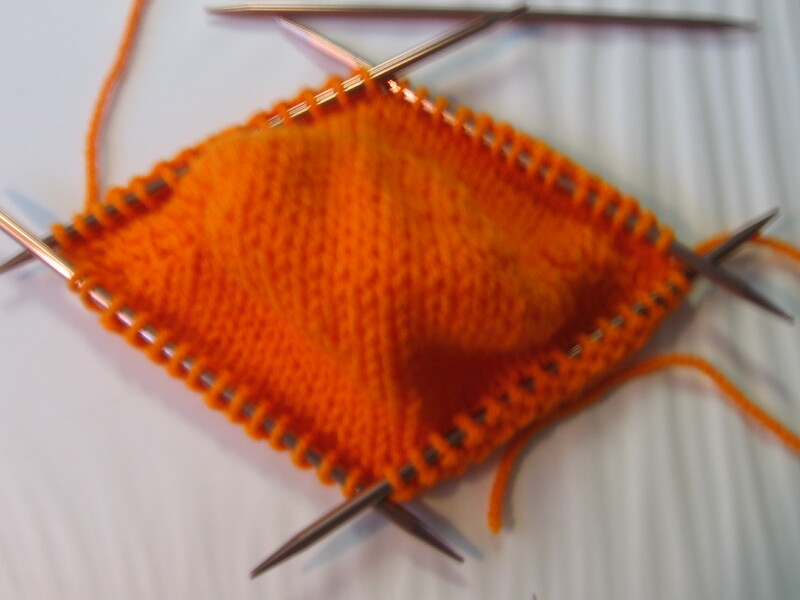 You may need to add a stitch or two, or take a couple out in order to finish just one stitch shy of the corner so it will be square instead of rectangular. 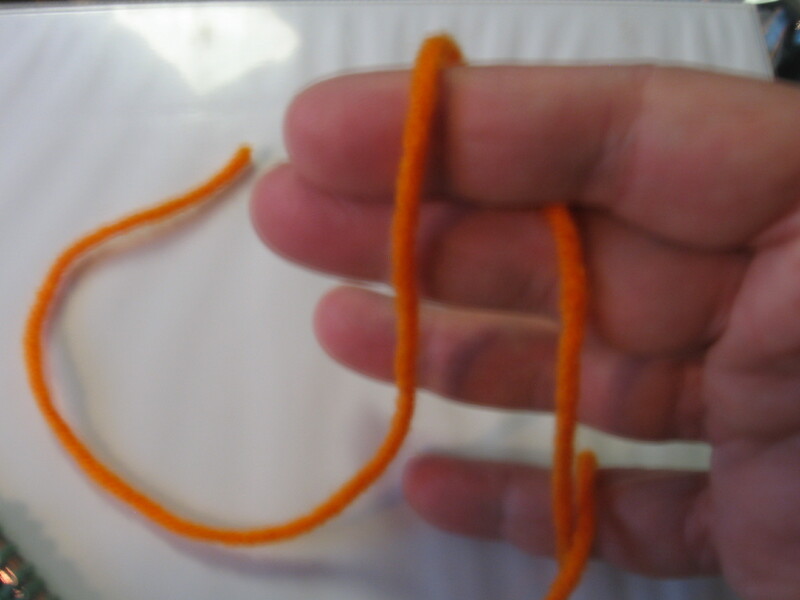 Cut your yarn leaving a LONG tail (approximately two yards long.) 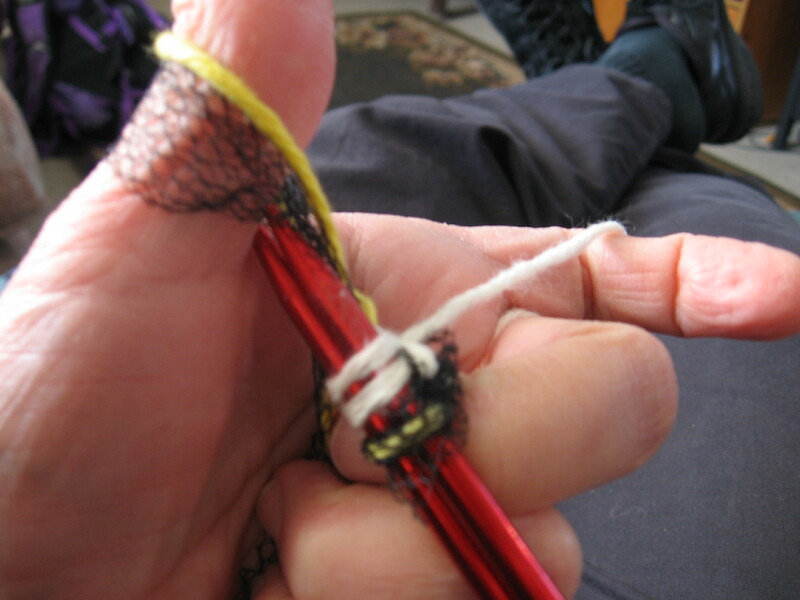 Thread your blunt tipped needle and stitch as shown, going back and forth through each set of stitches twice so it won’t be just a running stitch that could pull or pucker. 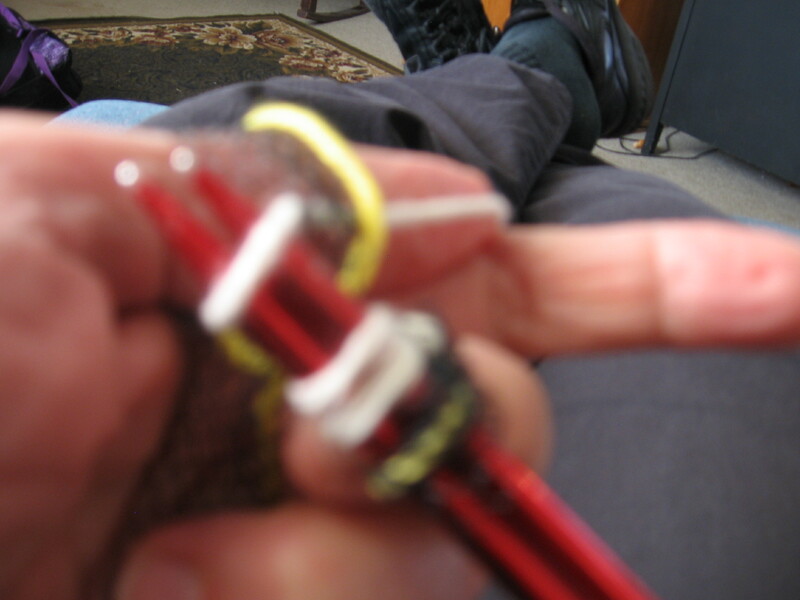 When you come to the corner, take the needle off your yarn. 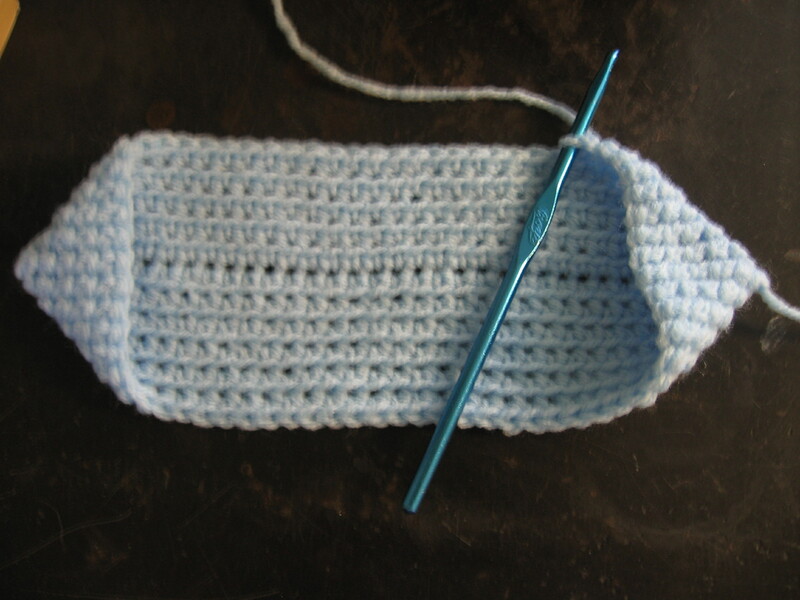 Pick up a loop to begin crocheting again by inserting your crochet hook down through both layers of the potholder slightly left of the corner, and pulling the yarn through. Chain 5 and attach slightly to the right of the corner by going down through both layers as before. 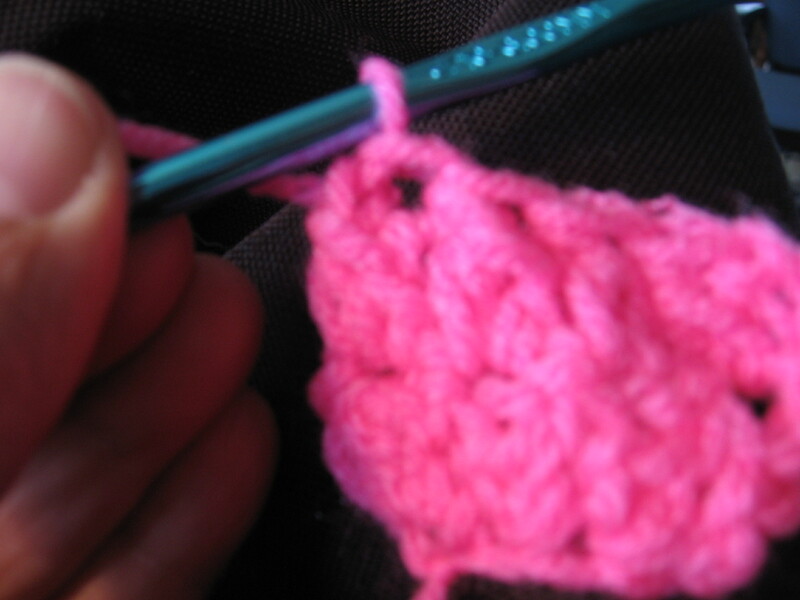 Single Crochet in the loop as many stitches as will fit, cinching the chain up as you go. This will form a nice round loop to hang your pot holder by. 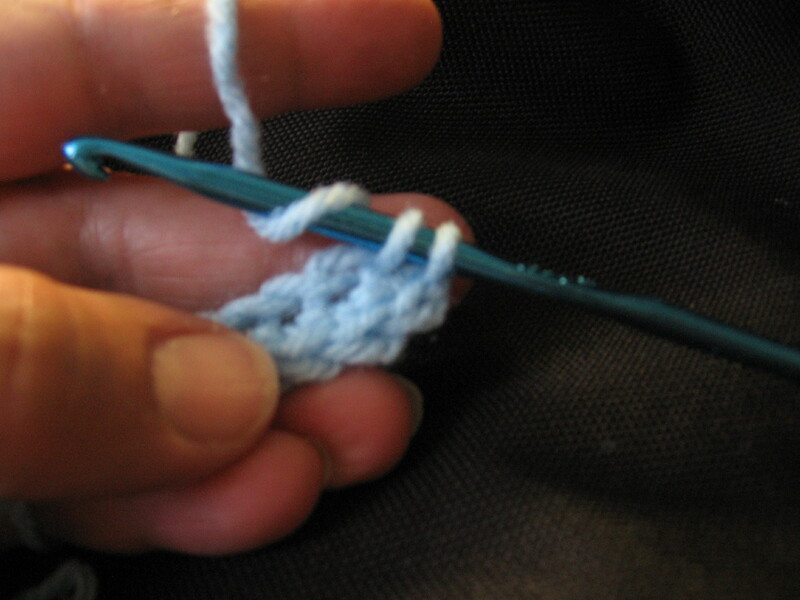 Pull the yarn all the way through the last single crochet stitch, as shown. 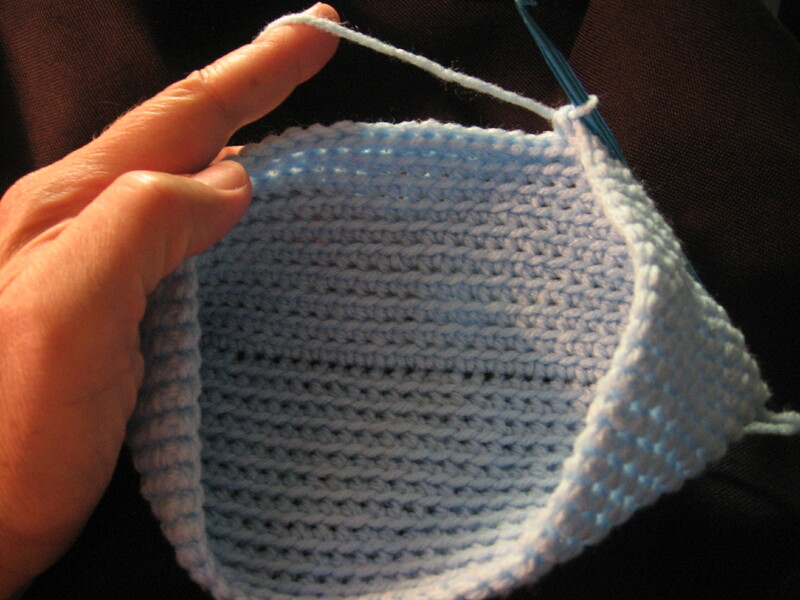 Poke your crochet hook through one layer of the pot holder starting from the corner farthest from the tail of your yarn, then out very near the tail end. 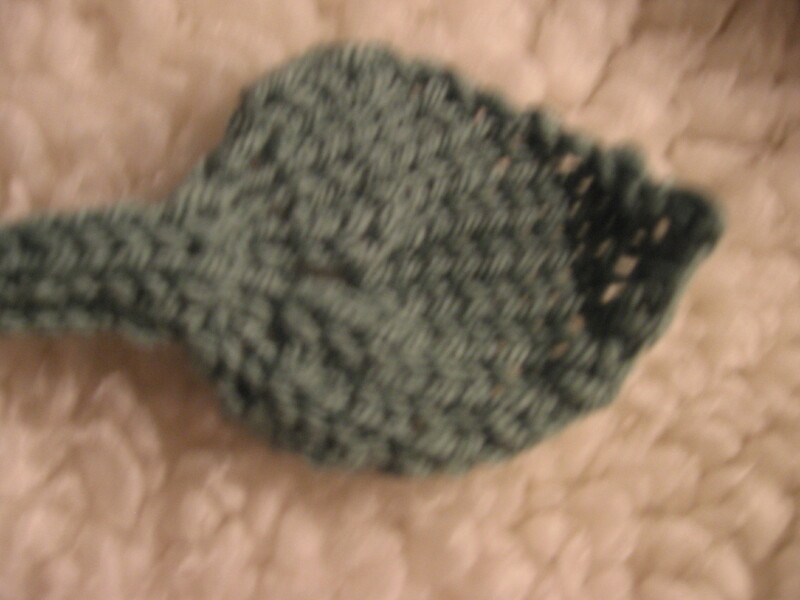 Pull the entire tail through to the inside of the potholder and you are finished! 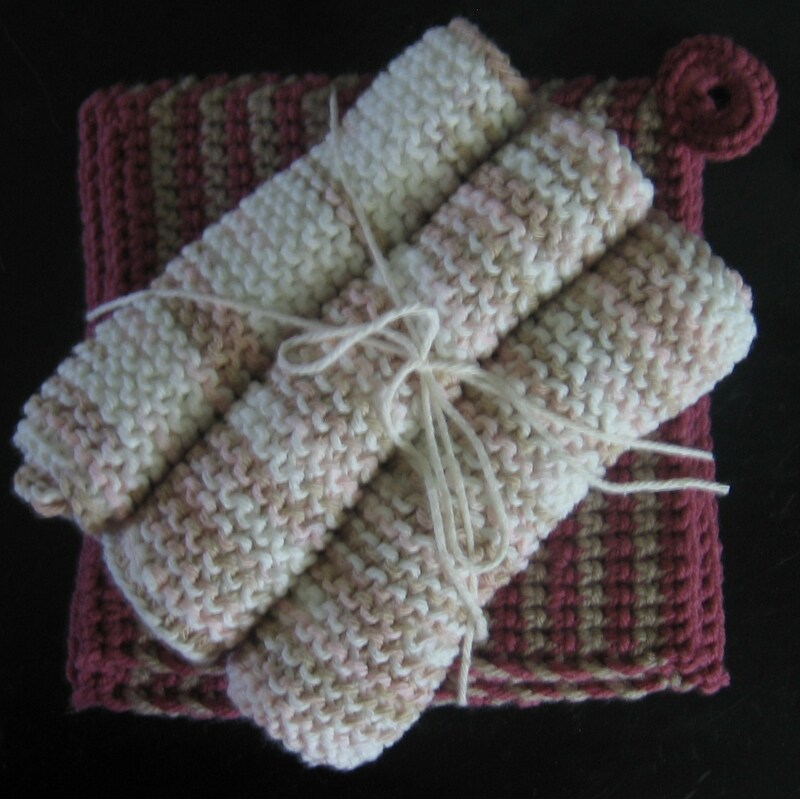 Alternately, the thermal single crochet stitch as seen here also makes wonderful potholders. 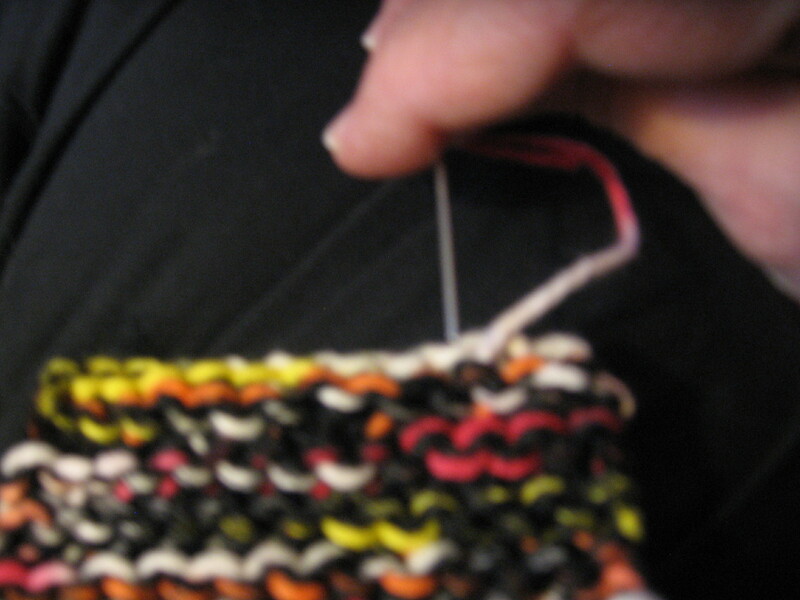 Chain 30 and continue the thermal crochet stitch until it’s square. 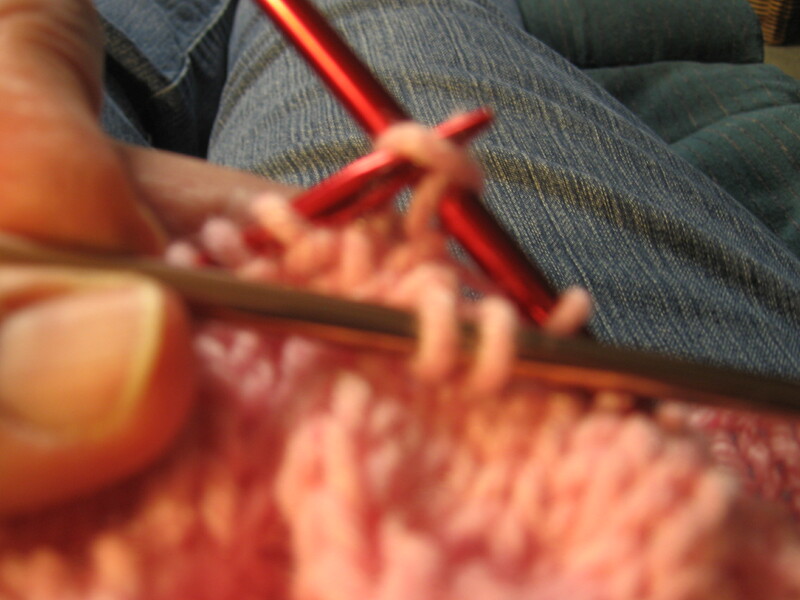 For best results, make sure your stitches are very tight. 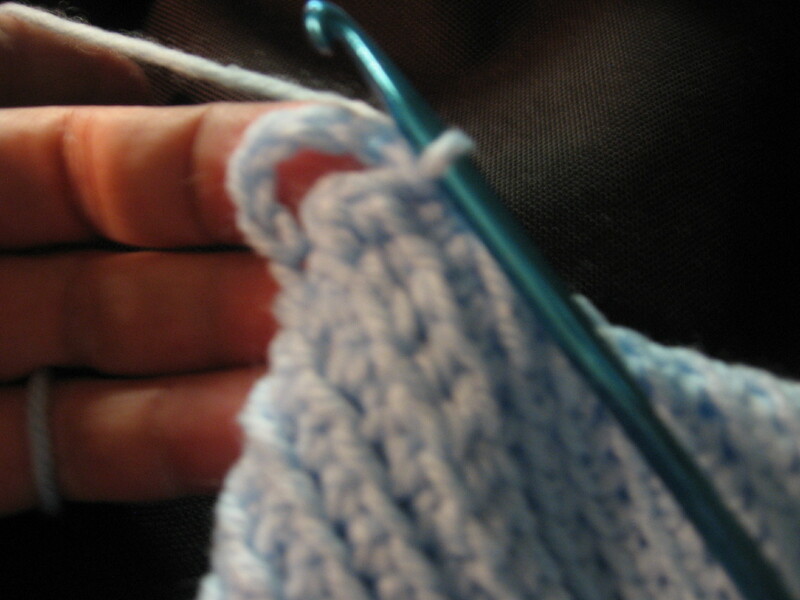 For the final row, slip stitch instead of single crochet. 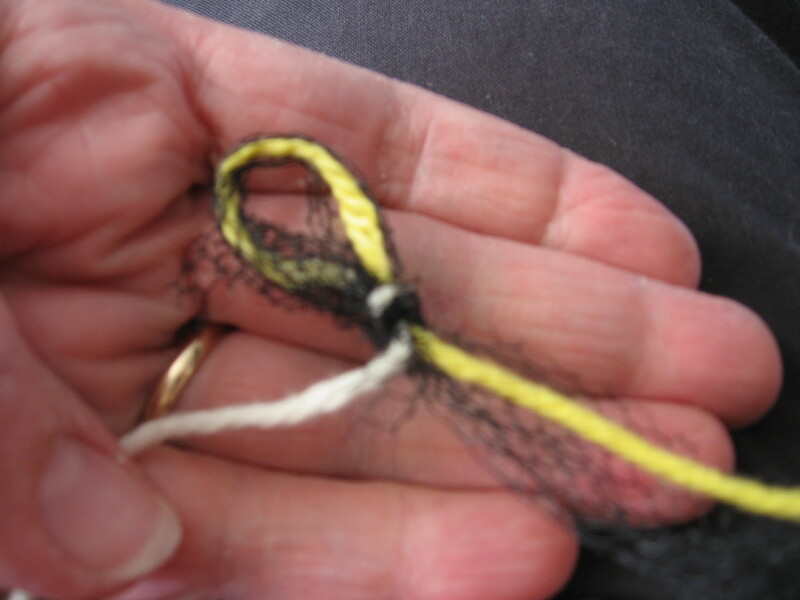 Finish off with a loop as described above and weave in the ends. 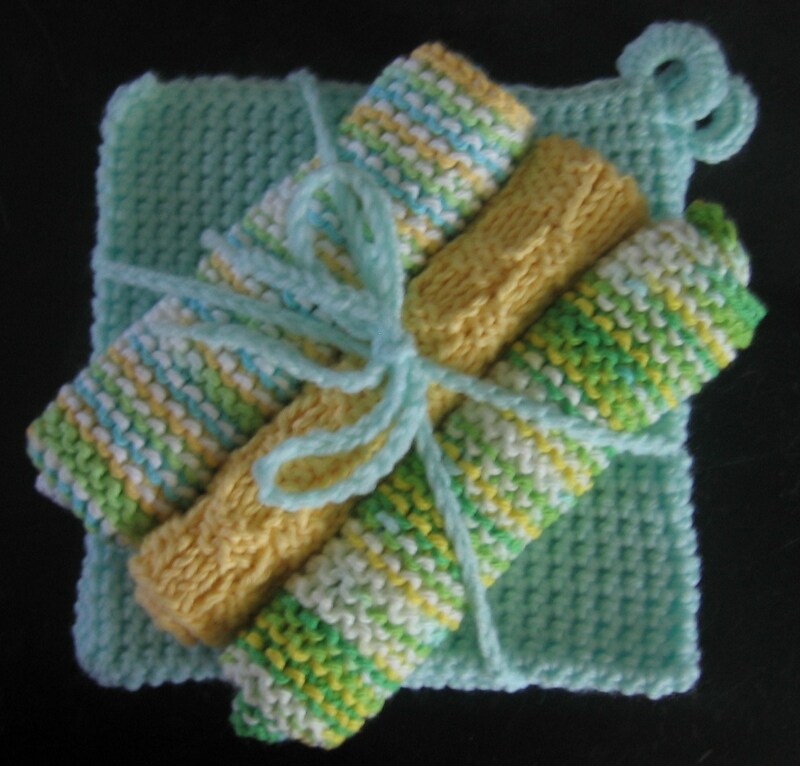 Wrap two hot pads with a few knit wash cloths and tie with ribbon or string for a handmade bridal or hostess gift. 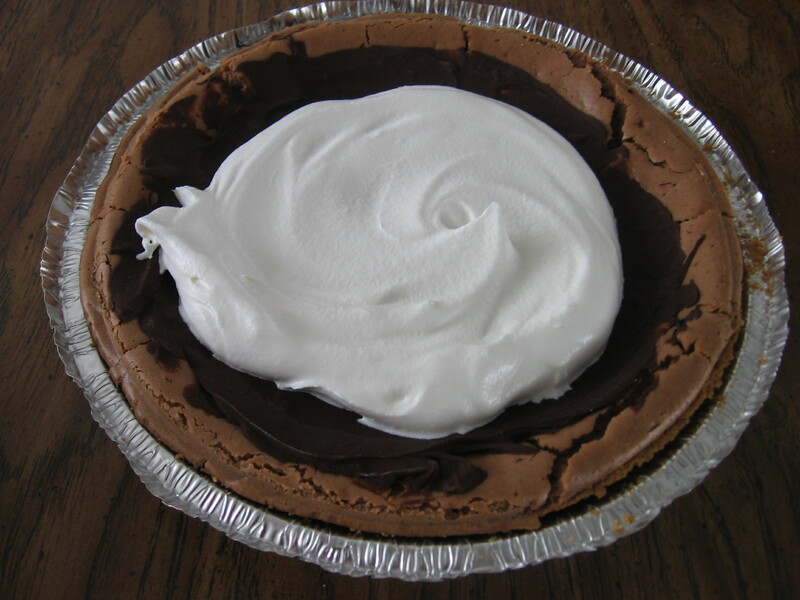 Add a personal touch with a copy of a favorite recipe.